본 발명은 무접점 충전장치에 관한 것으로, 보다 상세하게는 컴퓨터 USB 통신 가능하게 구성된 무접점 충전장치(1)와 휴대용 단말기의 충전용 배터리팩 사이에 유도기전력을 이용하여 무선 데이터 통신 및 전력공급이 가능하도록 구성한 것으로써, 데이터 통신 및 전력 공급을 함께 전송하도록 하며, 접촉전송에 다른 접촉불량이 없어 신호 전송이 양호하도록 하는 무접점 충전장치를 제공한다. The invention is to be, more particularly, to a computer USB communicable configured contactless charging apparatus (1) and using an induced electromotive force between the rechargeable battery pack for a mobile terminal wireless data communication and electric power supply of the non-contact charging device be configured to be written, and to send with the data communication and power supply, and provides a non-contact charging apparatus do not have a contact failure to the other contact transmission is transmitted to the well. 도 1은 본 발명에 따른 무접점 충전장치의 회로도이다. 1 is a circuit diagram of the non-contact charging apparatus according to the present invention. 도 2는 본 발명에 따른 무접점 충전장치의 IrDA 통신이 적용된 실시예의 사시도이다. Figure 2 is a perspective view of exemplary non-IrDA communication is applied to the contact charging device of the present invention. 도 3은 본 발명에 따른 무접점 충전장치에 IrDA 통신이 적용된 실시예의 회로도이다. Figure 3 is a schematic embodiment of the IrDA communication is applied to the non-contact charging apparatus according to the present invention. 도 4는 본 발명에 따른 무접점 충전기에서 24핀 커넥터를 사용하는 충전기, 어댑터, USB 포트를 입력으로 사용하는 실시예를 도시한 예시도이다. Figure 4 is an exemplary view showing an example of using as input the charger, the adapter, USB port using a 24-pin connector in the non-contact charger according to the present invention. 도 5는 본 발명에 따른 충전용 배터리팩의 회로도이다. 5 is a circuit diagram of a rechargeable battery pack according to the present invention. 도 6은 본 발명에 따른 충전용 배터리팩에 대한 다른 실시예의 회로도이다. Figure 6 is another embodiment of a circuit diagram of a rechargeable battery pack according to the present invention. 도 7은 본 발명에 따른 충전용 배터리팩의 제1실시예에 따른 분해사시도이다. 7 is an exploded perspective view according to a first embodiment of the rechargeable battery pack according to the present invention. 도 8은 본 발명에 따른 충전용 배터리팩의 제2실시예에 따른 분해사시도이 다. Figure 8 is a exploded sasidoyi according to a second embodiment of the rechargeable battery pack according to the present invention. 도 9는 본 발명에 따른 충전용 배터리팩의 제3실시예에 따른 분해사시도이다. Figure 9 is an exploded perspective view according to a third embodiment of the rechargeable battery pack according to the present invention. 도 10은 본 발명에 따른 충전용 배터리팩의 무선 전력 수신 모듈을 가진 배터리 팩에 대한 분해사시도이다. Figure 10 is an exploded perspective view of a battery pack having a wireless power receiving module of the rechargeable battery pack according to the present invention. 도 11은 종래 기술에 따른 핸드폰용 충전장치에 대한 사용상태도이다. Figure 11 is a using state diagram for a mobile phone charging apparatus according to the prior art. 본 발명은 무접점 충전장치에 관한 것으로, 보다 상세하게는 컴퓨터 USB 통신 가능하게 구성된 무접점 충전장치와 휴대용 단말기의 충전용 배터리팩 사이에 유도기전력을 이용하여 무선 데이터 통신 및 전력공급이 가능하도록 구성하여, 데이터 통신 및 전력 공급을 함께 전송하도록 하며, 접촉전송에 다른 접촉불량이 없어 신호 전송이 양호하도록 하는 무접점 충전장치를 제공한다. The present invention, more particularly constructed using an induced electromotive force between the rechargeable battery pack for a computer, the USB communication can be non-contact charging device and a mobile terminal configured to enable wireless data communication and electric power supply of the non-contact charging device to, and to transmit data with a communication and power supply, and provides a non-contact charging apparatus do not have a contact failure to the other contact transmission is transmitted to the well. 일반적으로 휴대용 단말기는 사용자가 휴대하고 이동하면서 사용하기 편리한 장치로, 핸드폰, PDA, MP3 플레이어 등이 있다. In general, easy-to-use, while the mobile terminal user to the portable and mobile device, a cell phone, PDA, MP3 player. 이러한 휴대용 단말기는 충전된 밧데리를 장착하거나 내부에 내재된 밧데리에 충전하면서 일정시간 동안 사용하도록 구성된다. The mobile terminal is configured to be used while charging to the mounted or embedded inside the battery charging the battery for a certain period of time. 따라서 필요한 때에 충전을 하고 필요한 데이터를 데스크탑 컴퓨터 또는 노트북으로부터 데이터를 전송받아서 원하는 기능을 작동하여 편리함을 제공하도록 구성된 것이다. Thus constructed receives the required charging time and transmit the data necessary data from the desktop computer or laptop to provide convenience to operate the desired function. 이러한 휴대용 단말기용 핸드폰용 충전기는 도 11에 도시된 대한민국 특허 공개번호 제10-2001-0026976호(핸드폰 충전장치)에 의하면, 외부로부터 공급되는 전원선이 본체(600) 일측에 구비되고, 본체(600)의 상부 장착공간(601)에 핸드폰(610)의 저부가 삽입되면서, 핸드폰(610)의 후면 저부의 전원 단자와 본체(600) 장착공간(601)의 내부 단자(602)가 접촉되면서 핸드폰(610)에 전원을 공급하도록 구성된다. According to the portable terminal the Republic of Korea Patent Publication No. 10-2001-0026976 call (cell phone charging apparatus) shown on the cellphone charger 11 for, the power source line supplied from the outside is provided on one side of the main body 600, a main body ( 600) while the internal terminal 602 of the bottom portion, a cellphone 610, the rear surface of the bottom power supply terminal and the main body 600, a mounting space (601 as the insertion of the mobile phone 610 to the upper mounting space 601) contacts the mobile phone ( 610) to be configured to supply the power. 이와 같은 종래의 전원공급장치는 전원만 공급할 뿐 데이터를 전송하거나 처리할 수 없어, 별도의 데이터 케이블을 이용하여 컴퓨터와 연결해야만 하는 불편함이 있다. The conventional power supply, such is not able to transmit or process the data as to supply only the power, there is the inconvenience that must be connected to the computer using a separate data cable. 또한 핸드폰의 단자와 본체의 단자는 접촉방식에 의하기 때문에 다수 회 반복하게 되면, 양측 단자 사이에 순간 전압변화가 발생하여 단자의 전기 접촉성이 불량하게 되고 기기의 안정성이 저하되는 문제점이 있다. In addition, in the mobile phone terminal and the terminal body has a problem that since the contact contacting manner when the number of times repeated, the transient voltage change between the both side terminals caused by an electrical contact between the terminal and the poor stability of the device decreases. 특히 습기가 있거나 먼지가 많이 있는 곳에서는 전기접촉성이 더욱 불량하여 핸드폰 및 전원공급장치가 고장날 우려가 있는 등의 문제점이 있다. Especially in moist or dusty places that have a lot of problems, such as that it might cause damage to the electrical contact between the cell phone and more bad power supply. 본 발명은 종래 기술의 문제점을 해결하기 위해 제안된 것으로, 본 발명의 목적은 TC, TA, 또는 PC의 USB Port의 출력을 전원 입력으로 하는 유도기전력을 이용한 무접점 전력 전송에 의해 휴대용 단말기(휴대폰, PDA, MP3 player, DAB 또는 DMB 단말기, PMP, 또는 Handheld 단말기 등)와 PC간 무선 데이터 통신과 무선 충전을 동시에 가능하게 하는, 무선 데이타 통신과 전력 전송이 가능한 무접점 충전장치 및 이를 이용한 휴대용 단말기를 제공하는 것이다. The present invention has been proposed to solve the problems of the prior art, an object of the present invention is a portable terminal by a non-contact power transmission using an induced electromotive force to an output of the USB Port of TC, TA, or PC to the power input (mobile , PDA, MP3 player, DAB or DMB terminal, PMP, or handheld terminals, etc.) and to enable at the same time, a wireless data communication and wireless charging liver PC, a wireless data communication and power transfer is possible non-contact charging device and a portable terminal using the same. to provide. 또한 본 발명의 다른 목적은, 충전하고자 하는 휴대용 단말기의 배터리 팩(2차측 무선충전 모듈이 내장된 팩) 이외의 다른 금속 이물질이 올려졌을 때 이를 감지하여 차단시킬 수 있는 이물질 감지 기능과, 휴대용 단말기의 배터리 팩을 인식하여 충전상태를 인식할 수 있는 식별기능을 가지며, 과부하와 온도 프로텍션 기능을 가지는, 무선 데이타 통신과 전력 전송이 가능한 무접점 충전장치 및 이를 이용한 휴대용 단말기를 제공하는 것이다. In addition, another object of the present invention, the battery pack of the mobile terminal to be charged (the secondary side wireless charging module is built pack) when turned the other metal impurities other than Be to detect this that can filter foreign matter detection and the mobile terminal of having an identification function that recognizes the battery pack can not recognize the state of charge, to having overload and temperature protection features, provides wireless data communication and power transfer is contactless charging apparatus and a portable terminal using the same available. 상기와 같은 목적을 달성하기 위한 본 발명 무선 데이타 통신과 전력 전송이 가능한 무접점 충전장치는, 함체형상의 장치몸체(2)의 일측으로 구비되어 컴퓨터 또는 노트북의 USB포트와 잭 결합 및 분리가 가능하게 연결되는 USB커넥터(10); The present invention a wireless data communication and power transfer is contactless charging apparatus capable of achieving the above object, the possible jack combination is provided to one side and the computer or laptop USB port of the apparatus body 2 of the housing shaped and separated USB connector 10 to be connected; 상기 USB커넥터(10)와 연결되어, 상기 컴퓨터 또는 노트북과 데이터를 송수신하도록 USB프로토콜로 에뮬레이션하는 USB드라이버블록(20); It is connected to the USB connector (10), USB driver block (20) to emulate a USB protocol to transmit and receive the data with a computer or laptop; 상기 USB커넥터(10)와 연결되고, 상기 컴퓨터 또는 노트북으로부터 공급되는 전원을 휴대용 단말기에 공급하거나 데이터를 송수신하기 위하여, 직렬공진 컨버터(50), 전류센싱블록(60) 및 전원공급용 부재를 제어하는 MPU 블록(30); To be connected to the USB connector 10, sends and receives the supply or the data on the power supplied to the mobile terminal from the computer or laptop, the series resonant converter 50, a current sensing block 60 and the power supply member controls for MPU block 30 to; 및 상기 직렬공진 컨버터(50)로부터의 데이터 신호 및 전원 신호를 상기 휴대용 단말기에 무선으로 전송하기 위하여 장치몸체(2)의 상부에 형성되는 1차코일(70)이 포함되어 구성된다. And it consists includes a primary coil 70 formed on top of the apparatus body 2 to transmit the wireless data signal and the power signal from the series resonant converter (50) to said portable terminal. 그리고 상기 직렬공진 컨버터(50)는 상기 USB드라이버블록(20)과 상기 휴대용 단말기 사이에 송수신되는 데이터 신호 및 상기 USB커넥터(10)로부터 상기 휴대용 단말기로 공급되는 전원 신호를 변환하도록 구성되며, 상기 전류센싱블록(60)은 상기 1차코일(70)과 대응되는 상기 휴대용 단말기측의 2차코일(80)에 의한 부하변조 신호를 감지하여 상기 MPU블록(30)으로 감지된 신호를 전송하도록 구성되어, 상기 MPU 블록(30)에서 1차코일(70) 및 상기 전류센싱블록(60)을 통하여 전송된 상기 2차코일(80)에 대한 감지신호를 분석하여 상기 휴대용 단말기를 인식하고 충전 전압을 안정전압으로 제어하도록 구성된 것을 특징으로 한다. And the series resonant converter 50 is configured to convert the power signal to be supplied to the portable terminal from the data signal and the USB connector 10 to be transmitted and received between the USB driver block 20 and the mobile terminal, wherein the current sensing block 60 is configured to transmit a sensed signal to the MPU block 30 to detect the load modulation signal by the secondary coil 80 of the portable terminal side corresponding to the primary coil (70) , the MPU analyzes the detection signal of the secondary coil 80 is transmitted through the primary coil 70 and the current sensing block 60 in the block 30 to recognize the mobile terminal and a stable charging voltage characterized in that is configured to control the voltage. 이에 상기 1차코일(70)은 분리형 변압기의 FPCB, PCB, 코일 및 페라이트 코어 중 어느 하나로 구성되고, 원형, 사각형 또는 다각형으로 형성되며, 상기 직렬공진 컨버터(50)는 반파형 또는 전파형으로 직렬/병렬 공진형 컨버터인 LLC 풀브릿 지 직렬 공진 컨버터로 구비되고, 상기 USB드라이버블록(20) 및 상기 MPU 블록(30)과 상기 직렬공진 컨버터(50) 사이에 구비되어 부츠트랩 게이트 드라이버를 구비한 게이트 드라이브 블록(40)과, 상기 2차코일(80) 신호 중 배터리 충전상태 신호를 감지한 상기 1차코일(70)로부터 신호를 전송받아 상기 MPU 블록(30)의 제어에 의해 충전용 밧데리(230)의 충전상태를 표시하는 디스플레이부(3)를 더 포함하여 구성될 수 있다. In the primary coil 70 is configured by any of the FPCB, PCB, coil and ferrite core of the separate transformers, round, formed in a square or polygonal shape, wherein the series resonance converter 50 is in series with a half wave or radio wave type / is provided with a parallel resonant converter, LLC pool BRIDGE series resonant converter, is provided between the USB driver block 20 and the MPU block 30 and the series resonant converter 50 is provided with a boots trap gate driver a battery for charging by controlling the gate drive block 40 and the secondary coil 80 receives transmitted signals from the primary coil 70 detects the battery state of charge signal in the signal, the MPU block 30 ( the display section 3 to display the state of charge of 230) may be configured by further comprising. 그리고 상기 장치몸체(2) 내부의 온도를 감지하고 상기 1차코일(70)의 온도를 측정하여, 회로 차단을 위하여 상기 MPU 블록(30)으로 신호를 전송하는 온도보호회로부(92)와; And with the apparatus body 2 detects the internal temperature, and the first to measure the temperature of the coil 70, the circuit temperature protection circuit (92) for transmitting a signal to the MPU block 30 to the block; 상기 1차코일(70)과 직렬로 연결되어, 상기 1차코일(70)에 흐르는 전류가 과다하거나 내부온도가 과열되면 전류를 차단하는 바이메탈(71)과; The primary coil 70 is connected in series with, the one when the current flowing through the primary coil 70 over the inner or overtemperature bimetal 71 that cut off the current and; 상기 장치몸체(2) 내부의 먼지 및 냄새를 감지하는 먼지냄새 센서(90)와; The apparatus body 2, the dust smell sensor 90 for detecting the dust and the smell of the interior and; 음이온을 발생하고 세균 박멸용 항균 스프레이를 분사하는 이온 발생부(91)가 더 구비된다. Negative ions, and the ion generating unit 91 for injecting the antimicrobial spray for eradication of bacteria is further provided. 그리고 상기 1차코일(70)에서는 일정한 인터벌의 PWM펄스가 발생되고, 이에 응답하는 상기 2차코일(80)로부터의 신호를 상기 전류센싱블록(60)에서 감지하여 상기 MPU 블록(60)으로 전송하되, 상기 MPU 블록(30)에서는 감지된 신호가 규정된 신호이면 ID를 부여하여 데이터 신호 및 전력신호를 전송하도록 하며, 응답이 없거나 응답신호가 규정된 신호가 아닌 것으로 검출되면 이물질로 판별하여 데이터 신호 및 전력 신호의 전송을 중지하도록 하는 이물질 감지기능을 구비한 것이다. And transmitted to the MPU block 60 to detect in the current sensing block 60 a signal from the secondary coil 80, which in the primary coil 70, and the PWM pulse of a constant interval occurs, in response but, to the MPU block 30 in the back of the sensed signal specified signal by giving the ID to transmit a data signal and the power signal, if the response is not present or is detected that not the response signal defined signal to determine a foreign object data to having a foreign object detection function is used for stopping the transmission of the signal and the power signal. 또한 상기 USB드라이버블록(20)은 USB프로토콜 및 IrDA로 서로 변환하는 IrDA 신호변환부(21)를 더 구비하고, 상기 IrDA 신호변환기(21)에 의해 IrDA로 변환된 데이터 신호를 상기 MPU 블록(30)의 제어에 의해 상기 휴대용 단말기와 서로 송수신하기 위한 IrDA 포트(22)를 더 구비하고, 상기 휴대용 단말기의 고유ID를 감지하여 구별하는 휴대용단말기ID 감별부를 더 구성할 수 있다. Further, the USB driver block 20 has the MPU block the data signal converted to the IrDA by the IrDA signal converter further comprising: a (21), and the IrDA signal converter 21 for converting to each other with a USB protocol and IrDA (30 ) it can be further provided, and further constitutes a portable terminal ID for differentiating distinguished by detecting the unique ID of the portable terminal to the IrDA port 22 to send and receive each other and said mobile terminal under the control of. 본 발명의 다른 실시로, 충전용 배터리팩는 상기의 무접점 충전장치(1)의 장치몸체(2) 일측과 서로 접촉가능하도록 하며, 상기 1차코일(70)과 비접촉 상태에서 자기장에 의해 데이터 신호를 송수신하고 전력 신호를 전송받기 위한 상기 2차코일(80)이 일측에 구성된 충전체몸체(201); To another embodiment of the present invention, the charging non-contact charging of the battery paekneun the device (1) for the apparatus body 2, and one end and to be in contact with each other, data signals by the magnetic field from the primary coil 70 and the non-contact state filler body 201 configured for transmitting and receiving and the secondary coil 80 for receiving the transmitted power signal is one; 상기 충전체몸체(201) 내부 일측의 상기 2차코일(80)과 연결되어 상기 1차코일(70)로부터 전송되는 전력 신호를 처리하여 충전용 밧데리(230)에 전송하고, 상기 1차코일(70)과 송수신되는 데이터 신호를 처리하는 충전체제어부(210); Transmitted to the filler body 201, the secondary coil 80 is connected to the primary coil (70) for charging the battery 230 by processing the power signal transmitted from the inner side, and the primary coil ( 70) and the charging system fisherman (210 to process data signals that are transmitted and received); 상기 충전체제어부(210)의 제어에 의하여 상기 충전용 밧데리(230)에 충전용 전력을 전송하도록 하는 충전회로(220)가 포함되어 구성되며, 상기 충전회로(220)는 상기 충전용 밧데리(230)의 전원을 상기 휴대용 단말기로 공급되도록 구성된다. Consists it includes a charging circuit 220 which to transmit the power for charging to the charging battery 230 by the control of the charging system fisherman 210, the charging circuit 220 includes a battery (230 for the filling ) is configured such that the supply power to the portable terminal. 이에 상기 충전체제어부(210)는 상기 무접점 충전장치(1)로부터 최초 연결된 것을 감지하면 고유ID를 상기 2차코일(80) 및 상기 1차코일(70)을 통하여 상기 무접점 충전장치(1)로 전송하도록 하는 고유ID부, 상기 충전용 밧데리(230)의 충전정도를 감지하여 상기 무접점 충전장치(1)로 전송하는 충전감지부를 포함하여 구비되고, 상기 충전체몸체(201)는 상기 휴대용 단말기와 분리 및 체결이 가능하도록 별체로 형성되는 분리형팩으로 구성되거나, 또는 상기 휴대용 단말기의 본체 케이스 내부에 내재되어 일체로 형성되는 일체형팩으로 구성되며, 상기 2차코일(80)은 분리형 변압기의 FPCB, PCB, 코일 및 페라이트 코어 중 어느 하나로 구성되고, 원형, 사각형 또는 다각형으로 형성되어 구성할 수 있다. In the charging system fisherman 210 the contactless charging apparatus 1 first detects that connected the contactless a unique ID through the secondary coil 80 and the primary coil 70, the charging device (1 from ) unique ID part to be transferred to, to detect the degree of filling the free is provided, including the contact charging detection to be transmitted to the charging device (1) parts of the filler body (201) of the charging battery 230 for the above or composed of separate packs that are formed separately to enable the mobile terminal and the separation and fastening, or inherent in the case body interior of the mobile terminal consists of a one-piece pack are integrally formed, the secondary coil 80 is detachable transformer a FPCB, PCB, and configured coil and one of a ferrite core can be constructed is formed in a circular, square or polygonal. 그리고 상기 충전체몸체(201)는 충전리시버모듈(517)에 권선된 2차코일(516)로부터 유도된 전력이 무선 전력 수신 회로(513)을 통하여 충전하는 배터리셀(512), 상기 배터리셀(512) 저면, 전후좌우 사면을 감싸며, Al, Cu, 또는 Ni Alloy metal을 포함하여 구성되어 자기장으로부터 상기 배터리셀(512)을 보호하는 차폐판(515)(515-1)(515-2)(515-3)(515-4), 상기 차폐판(515)과 상기 충전리시버모듈(517) 사이에 구비되어 페라이트 계열, Mn - Zn (50 중량부 : 50 중량부), Ni - Fe (80 중량부 : 20 중량부), 또는 파일메탈(Finemetal, Fe-Si-Cu-Nb)을 포함하여 구성되어 2차코일(516)에 유도자기장이 잘 유도되도록 하는 자성판(503), 상기 차폐판(515)과 상기 배터리셀(512) 사이에 NI-Cu로 된 Mesh 또는 방열할 수 있으며 열전도를 떨어뜨릴 수 있는 절연체로 구비되어 상기 차폐판(515)의 열이 배터리셀(512)에 전 Further, the filler body 201, a battery cell 512, the battery cell to charge the inductive power from the secondary coil 516 wound around the charge receiver module 517 through a wireless power receive circuit 513 ( 512) surrounding the bottom surface, left and right front and rear surfaces, Al, Cu, or the shielding plate 515, (515-1) (515-2) that is configured to include the Ni Alloy metal protecting the battery cell 512 from the magnetic field ( is provided between 515-3), (515-4), the shielding plate 515 and the charge receiver module 517 a ferrite series, Mn - Zn (50 parts by weight: 50 parts by weight), Ni - Fe (80 wt. parts: 20 parts by weight), or a file-metal (Finemetal, is configured including Fe-Si-Cu-Nb) 2 magnetic plate 503 such that the induced magnetic field well induced in the primary coil 516, the shield plate ( 515) and the battery cell to Mesh or radiation to the NI-Cu between 512 and is provided with an insulator that can reduce the thermal conductivity of the thermal shield plate 515 is around the battery cell (512) 도되지 않도록 하는 절연판(502), 그리고 상기 무선 전력 수신 회로(513)를 감싸며 Al, Cu, 또는 Ni Alloy metal을 포함하여 구성되어 상기 무선 전력 수신 회로(513)에 자기장을 차폐하는 차폐부재(501)를 포함하여 구성될 수 있다. FIG insulating plate 502, and shield members (501, which is configured by the wireless power receive circuit 513 includes the surrounding Al, Cu, or Ni Alloy metal shielding a magnetic field to the wireless power receive circuit 513, to prevent ) it can comprise. 그리고 본 발명의 또 다른 실시인 무접점 충전장치를 이용한 휴대용 단말기는 상기의 무접점 충전장치(1)로부터 전원을 공급받고 데이터를 송수신하도록 구성된다. And a portable terminal using a further embodiment the non-contact charging apparatus according to the present invention receives power from the non-contact charging apparatus 1 of the above is configured to transmit and receive data. 또한 휴대용 단말기는 상기의 일체형팩의 충전체몸체(201)를 구비하는 충전용 배터리팩(200)을 내재하여, IrDA 컨트롤러(302) 및 무접점 충전장치(1)의 IrDA 포트(22)와 데이터 통신을 하는 IrDA 포트를 포함하여 구성될 수 있다. In addition, the mobile terminal to inherent charging the battery pack 200 are provided with a filler body 201 of the one-piece pack of the above, IrDA port 22 and the data of the IrDA controller 302 and the non-contact charging apparatus (1) It can comprise an IrDA port that communication. 나아가 휴대용 단말기는 상기의 충전용 배터리팩(200)의 터미널 블록(240)과 전기적으로 접촉되어 전원을 공급받는 전력수신터미널블록(310)과, 상기 전력수신터미널블록(310)과 연결되어 전력을 변환하는 DC/DC 컨버터(320) 및 상기 DC/DC 컨버터(320)에서 변환된 전력을 충전하는 충전블록(330)를 구성할 수 있다. Furthermore, the mobile terminal power is connected to the terminal block 240 and the electrical contact with the power supplied on the power receiving terminal block 310, the power receiving terminal block 310 of the rechargeable battery pack 200 for the It can be configured to convert charging block 330 to charge the converted electric power from the DC / DC converter 320 and the DC / DC converter 320. 이하 첨부되는 도면을 참조하여 상세히 설명한다. With reference to the accompanying drawings which will be described in detail below. 즉 본 발명 무접점 충전장치(1)는 도 1 내지 도 10에서와 같이, 함체형상의 장치몸체(2)의 일측으로 구비되어 컴퓨터 또는 노트북(100)의 USB포트와 잭 결합 및 분리가 가능하게 연결되는 USB커넥터(USB Connector)(10); That is, the present invention non-contact charging apparatus 1, such as from 1 to 10 degrees, is provided to one side of the apparatus body 2 of the housing shaped to enable the USB port and jack coupling and separation of the computer or laptop 100 USB connector is connected (USB connector) (10); 상기 USB커넥터(10)와 연결되어 상기 컴퓨터 또는 노트북(100)과 데이터를 송수신하도록 USB프로토콜로 에뮬레이션하는 USB드라이버블록(USB Emulation Control Block)(20)이 구비된다. It is connected to the USB connector 10. The USB driver block (USB Emulation Control Block) (20) to emulate a USB protocol to transmit and receive a computer or laptop 100 and the data is provided. 또한 상기 USB커넥터(10)와 연결되어, 상기 컴퓨터 또는 노트북(100)으로부터 전원을 공급받아 휴대용 단말기(300)에 공급하거나 데이터를 송수신하기 위하여, 직렬공진 컨버터(LLC Full-bridge Serial Resonator Converter)(50), 전류센싱블록(Current sensing Block)(60) 및 전원공급용 부재 등을 제어하는 MPU 블록(Micro Processor Unit Block, MPU Block)(30)이 구비된다. Also connected with the USB connector 10, receives the power supplied from the computer or laptop 100 to transmit and receive the supply or data to the mobile terminal 300, a series resonant converter (LLC Full-bridge Serial Resonator Converter) ( 50), the current sensing block (current sensing block) block MPU (Micro Processor Unit block, MPU block) (30 for controlling the 60 and the power supply member) is provided. 그리고 상기 직렬공진 컨버터(50)로부터의 데이터 신호 및 전원 신호를 상기 휴대용 단말기(300)에 무선으로 전송하기 위하여 장치몸체(2)의 상부에 형성되는 1차코일(70) 등으로 구성된다. And it is composed of a primary coil 70 formed on top of the apparatus body 2 in order to transmit wirelessly to the portable terminal 300, the data signal and the power signal from the series resonant converter (50). 이에 상기 직렬공진 컨버터(Resonator Convertoer)(50)는 상기 USB드라이버블록(20)과 상기 휴대용 단말기(300) 사이에 송수신되는 데이터 신호 및 상기 USB커넥터(10)로부터 상기 휴대용 단말기(300)로 공급되는 전원 신호를 변환하도록 구성된 것이다. In the series resonant converter (Resonator Convertoer) (50) is supplied to the USB driver block 20 and the mobile terminal data signal and the mobile terminal 300 from the USB connector 10 to be transmitted between the 300 It is configured to convert the power signal. 그리고 상기 전류센싱블록(60)은 상기 1차코일(70)과 대응되는 상기 휴대용 단말기(300) 측의 2차코일(80)에 의한 부하변조(Load regulation) 신호를 감지하여 상기 MPU 블록(30)으로 신호를 전송하도록 구성된 것으로, 상기 MPU 블록(30)에서는 1차코일(70) 및 상기 전류센싱블록(60)을 통하여 전송된 상기 2차코일(80)에 대한 감지신호를 분석하여 상기 휴대용 단말기(300)를 인식하고 충전 전압을 안정전압으로 제어하도록 구성된 것이다. And the current sensing block 60 is the primary coil 70 and the load modulation caused by the secondary coil 80 of the portable terminal 300 side corresponding to (Load regulation) detected by the MPU block the signal (30 ) to be configured to transmit the signal, the MPU block 30 was to analyze the sensed signal to the primary coil 70 and secondary coil 80 is transmitted via the current sensing block 60, the portable recognize the terminal 300, and is configured to control the charging voltage to a stable voltage. 그리고 상기 1차코일(70)은 분리형 변압기의 FPCB, PCB, 코일(Coil) 및 페라이트 코어(Ferrite Core) 중 어느 하나로 구성되고, 이를 위한 상기 직렬공진 컨버터(50)는 일반적인 변압기용 공진형 컨버터로 구성될 수 있으며, 특히 반파형 또는 전파형으로 직렬/병렬 공진형 컨버터인 LLC 풀브릿지 직렬 공진 컨버터(LLC Full-bridge Serial Resonator Converter)로 구성하여 안정적인 전력 전송이 되도록 구성함이 바람직하다. And a FPCB, PCB, the coil (Coil) and ferrite core (Ferrite Core) of any one being configured, the series resonant converter (50) is resonant converter for common transformer therefor of the primary coil 70 is detachable transformer can be configured, and it is particularly preferable to configure such that a stable power transmission constituted by a full-bridge LLC series resonant converter (LLC Full-bridge resonator serial converter) half wave, or series / parallel resonant converter in spread type. 또한 상기 USB드라이버블록(20) 및 상기 MPU 블록(30)과 상기 직렬공진 컨버터(50) 사이에 구비되어 부츠트랩 게이트 드라이버(Bootstrap Gate Driver)를 구비한 게이트 드라이브 블록(FET Gate Drive Block)(40)과, 상기 2차코일(80) 신호 중 배터리 충전상태 신호를 감지하기 위한 상기 1차코일(70)로부터 신호를 전송받아 상기 MPU 블록(30)의 제어에 의해 충전용 밧데리(230)의 충전상태를 표시하는 디스플레이부(3)를 더 포함하여 구성한 것이다. In addition, the gate drive block (FET Gate Drive Block) (40 provided with the USB driver block 20 and is provided between the MPU block 30 and the series resonant converter (50) boots trap gate driver (Bootstrap Gate Driver) ), a charge of the secondary coil 80 charges the battery 230 for the by receiving transmitted signals from the primary coil 70 for detecting a battery state of charge signal in the signal to the control of the MPU block 30 It is configured to further include a display unit 3 that displays the condition. 나아가 도 1 및 도 3과 같이 상기 장치몸체(2) 내부의 온도를 감지하고 상기 1차코일(70)의 온도를 측정하여 측정된 온도의 과열 여부, 고온 여부에 따라 회로 차단을 위하여 상기 MPU 블록(30)으로 신호를 전송하는 온도보호회로부(92)와, 상기 1차코일(70)과 직렬로 연결되어 상기 1차코일(70)에 흐르는 전류가 과다하거나 내부온도가 과열되면 전류를 차단하는 바이메탈(Bimetal)(71)과, 상기 장치몸체(2) 내부의 먼지 및 냄새를 감지하는 먼지냄새 센서(90)와, 음이온을 발생하고 세균 박멸용 항균 스프레이를 분사하는 이온 발생부(91)를 더 구비할 수 있다. Furthermore, FIG. 1 and the MPU block for the device body (2) whether the detected temperature of the interior, and overheating of the measured temperature by measuring the temperature of the primary coil 70, the circuit breaker according to a high temperature whether or not as shown in FIG. 3 and 30 to signal the temperature protection circuit (92) for transmitting, when the primary coil (70) and connected in series to the first current flowing through the primary coil (70) over or inside temperature is too hot to cut off the current a bimetal (bimetal) (71) and the ion generating unit 91 to the apparatus body 2, the dust smell sensor 90 for detecting the dust and odor inside, negative ions, and injecting the antimicrobial spray for bacterial eradication It may be further provided. 또한 이와 같은 과열 방지용 온도센서를 구비한 온도보호회로부(92), 바이메탈(71), 먼지냄새 센서(90) 및 이온 발생부(91) 등은 무접점 충전장치(1)와 결합 및 작동하는 충전용 배터리팩(200) 및 휴대용 단말기(300) 등에도 적절한 구성으로 구비함이 바람직하다. In addition, this temperature protection circuit 92 having an overheating preventing temperature sensors, such as, bimetal 71, the dust smell sensor 90 and the ion generating unit 91 and so on are charged to combine and operate with contactless charging apparatus (1) for battery pack 200 and the portable terminal 300 or the like it is also preferable to having a suitable configuration. 이와 같이 구비된 본 발명 무접점 충전장치(1)의 구성 및 작동을 살펴보면 다음과 같다. Looking at the configuration and operation of the invention, non-contact charging apparatus 1 provided in this manner are as follows. 즉 본 발명은 코어-투-코어(Core-to-Core) 통신 방식을 이용하여, 무접점 충전장치(1)와, 충전용 배터리팩(200) 또는 충전용 배터리팩(200)이 내장된 휴대용 단말기(300) 간에 데이타 통신뿐만 아니라 충전용 전력을 함께 전송하도록 하는 구성이다. That is, the present invention is a core-to-core (Core-to-Core) by using a communication method, non-contact charging apparatus 1 and, the rechargeable battery pack 200 or the rechargeable battery pack Portable the 200 is built for as well as data communication between the terminal 300 is configured to be transmitted with the power for charging. 이러한 무접점 충전장치(1)는 휴대용 단말기(300), 충전용 배터리팩(200) 및 무접점 충전장치(1) 내부 시스템의 상태를 감시하고 제어할 수 있는 컴퓨터 또는 노트북(100)과 통신하는 통신수단을 수반한다. These non-contact charging apparatus 1 is in communication with the mobile terminal 300, a battery pack for charging 200 and the non-contact charging apparatus 1, a computer or a laptop that can monitor and control the status of the internal system 100 It involves the communication means. 이에 본 발명에서는 컴퓨터 또는 노트북(100)과 무접점 충전장치(1) 간에 USB 통신에 의하여 통신함을 예로 하였으며, 이는 USB 통신은 데이터 통신과 함께 충전용 전력을 하나의 회선으로 동시에 공급할 수 있기 때문이다. Therefore, in this invention it was an example that the communication by the USB communication between the computer or laptop 100 and the non-contact charging apparatus (1), which USB communication is due to supplying the charge power for with the data communication at the same time as a single line to be. 그러나 RS-232c, SISC 및 시리얼, 패럴럴 등과 같은 다수의 데이터 전용 통신 방식으로 무접점 충전장치(1)와 컴퓨터 또는 노트북(100) 사이에 데이터 통신 연결이 가능하며, 이러한 경우에는 무접점 충전장치(1)는 별도의 일반적인 방법으로 전원을 공급받을 수 있다. However, a number of data-only non-contact charging to the communication system device (1) with a computer or laptop 100 to the possible data communication connection between, in this case, the non-contact charging device, such as a RS-232c, SISC and serial, parallel barrels (1) it can be powered by a separate general way. 즉 무접점 충전장치(1)는 컴퓨터 또는 노트북(100)으로부터 통신연결됨과 함께 주변기기인 휴대용 단말기(300)의 충전용 전력을 컴퓨터 또는 노트북(100)으로부터 공급받을 수 있을 뿐만 아니라, 이와 다르게 별도의 일반적인 방법으로 전원 공급을 받을 수 있어, 결국 무접점 충전장치(1)와 휴대용 단말기(300) 사이에 충전 및 데이터 통신이 모두 가능하도록 구비한 것이다. I.e., non-contact charging apparatus 1 as well as power is supplied to the charging power of the portable terminal 300, peripheral devices with the communication connected from a computer or laptop 100 from a computer or laptop 100, alternatively a separate can be powered in the usual way, after all solid state will equipped to enable all of the charging and data communication between the charging device 1 and the portable terminal 300. 즉 본 발명에서 예시하는 바람직한 실시예는 컴퓨터 또는 노트북(100)과 무접점 충전장치(1) 간에는 USB 통신방식으로 하였으며, 이러한 USB 통신 회선은 네개의 단자 중, 두개의 단자는 전원을 공급하며, 나머지 두 단자는 데이터를 전송하도록 규약되어있다. That is, a preferred embodiment is between a computer or laptop 100 and the non-contact charging apparatus (1) was a USB communication system, one of these USB communication line has four terminals, two terminals for illustrating the present invention provides power, the remaining two terminals are protocols to transmit data. 따라서 USB 통신방식으로 무접점 충전장치(1)와 전원공급 및 데이터 송수신이 가능한 것이다. Thus capable of non-contact charging apparatus 1 and the power supply and data transmission and reception with the USB communication method. 이러한 USB 통신방식에서는 컴퓨터 또는 노트북(100)에 호스트 컨트롤러(Host Controller)가 내재되어 있어, 회선으로 연결되는 기기들을 제어할 수 있는 것이다. In such a USB communication system has become a host controller (Host Controller) inherent in computer or laptop 100, it is possible to control the equipment connected to the line. 그리고 이에 대응되는 무접점 충전장치(1)의 USB 드라이버블록(20)은 무접점 충전장치(1)의 USB용 컨트롤러가 내재되는 것으로, 무접점 충전장치(1)의 상태 및 무접점 충전장치(1)와 연결되는 충전용 배터리팩(200) 또는 휴대용 단말기(300)와 결합된 경우에 이들의 정보를 컴퓨터 또는 노트북(100) 에 USB 방식으로 변환하여 송수신하게 된다. And this USB driver block 20 of the non-contact charging apparatus (1) corresponding to the to be a USB controller for a non-contact charging apparatus (1) inherent in a state of non-contact charging apparatus 1 and the non-contact charger ( 1) when combined with a rechargeable battery pack 200 or the handy terminal 300 for being connected to the transmission and reception is converted to a USB system on a computer or laptop 100 to these information. 또한 이러한 USB 통신방식으로 통신하는 것은 1차코일(70) 및 2차코일(80)에서 비록 변조된 상태로 송수신된다. Also communicating with this USB communication system are transmitted and received as though the modulation states in the primary coil 70 and secondary coil 80. 그리고 충전용 배터리팩(200)에도 USB 통신을 위한 컨트롤러가 충전체제어부(210)에 내재될 수 있으며, 또한 휴대용 단말기(300)에도 USB 통신을 위한 컨트롤러가 내재될 수 있으며, 이들 통신 신호는 무접점 충전장치(1)의 USB드라이버블록(20)을 거쳐야 하는 것이므로 결국 무접점 충전장치(1)를 허브로 하여 컴퓨터 또는 노트북(100)과 USB 방식의 통신을 하게 된다. And even charged battery pack 200 is a controller for the USB communication can be inherent to the charging system fisherman 210, and also can be a controller for the USB communication in the mobile terminal 300 is embedded, these communication signals are non- end is a non-contact charging apparatus (1) to the hub computer or laptop 100 and the USB communication scheme, because of which go through the USB driver block 20 of the contact charging device (1). 따라서 상기 코어-투-코어(Core - to - Core) 통신 방식을 이용한 무접점 충전장치(1)와 휴대용 단말기(300) 간의 데이타 통신 및 전력을 전달하는 무접점 충전장치(1)는, 컴퓨터, 노트북(100)의 USB 포트로 연결하기 위한 USB커넥터(USB Connector)(10); Therefore, the core-to-core (Core-to-Core) non-contact charging apparatus (1) for transmitting a data communication and power between a communication method for contactless charging apparatus 1 and the portable terminal 300 using the computer, USB connector (USB connector) (10) for connecting to the USB port of the laptop 100; 상기 컴퓨터, 노트북(100)과 USB커넥터(10)와 연결되어, 음악, 동영상, 데이타를 수신받아 USB 프로토콜로 에뮬레이션하는 USB드라이버블록(USB Emulation Control Block)(20); The computer, a notebook 100, and is connected to the USB connector 10, music, video, and receives the data block USB drivers that emulate a USB protocol (USB Emulation Control Block) (20); 무접점 충전장치(Wireless Charger)(1)의 내부 소자를 제어하기 위한 MPU블록(30); Solid state MPU block 30 for controlling the internal device of the filling device (Wireless Charger) (1); 부츠트랩 게이트 드라이버(Bootstrap Gate Driver)를 포함하는 게이트 드라이브 블록(Gate Drive Block)(40); Boots trap gate driver (Bootstrap Gate Driver) gate drive block including (Gate Drive Block) (40); LLC 풀브릿지 직렬 공진 컨버터(LLC Full-bridge Serial Resonator Converter)인 직렬공진 컨버터(50); LLC is full bridge series resonant converter 50, the series resonant converter (LLC Full-bridge Resonator Serial Converter); FPCB, PCB, 코일, 페라이트 코어로 구성된 분리형 변압기로써, 상기 MPU 블록(30)의 제어에 따라 신호를 무선으로 전송하여 휴대용 단말기(300)에 내장된 배터리 팩의 2차코일(80)로 전송하기 위한 1차코일(70); As a separate transformer consisting of a FPCB, PCB, coils, ferrite cores, to transmit signals over the air according to the control of the MPU block 30 to transmit to the secondary coil 80 of the battery pack built in the portable terminal 300, primary coils 70; CL 공진부에 직렬로 연결되고, 모든 칩의 기능이 마비되었을 때 또는 코어(1차코일(70))가 과열되었을 때 차단할 수 있도록 삽입하여 안전장치를 확보하기 위한 바이메탈(Bimetal)(71); When connected in series with a CL resonance section it is, of all the chip features attack or the core is inserted to block the bimetal (Bimetal) (71) for securing a safety device when the (primary coil 70) has been overheated; 상기 무접점 충전장치(1)의 먼지 및 냄새를 감지하기 위한 먼지냄새 센서(Dust & Smell Sensor Circuit)(90); The contactless dust smell sensor (Dust & Smell Sensor Circuit) for detecting the dust and the smell of the charging device 1 90; 부가적인 음이온 발생기능이나 세균 박멸을 위한 향균 스프레이 분사하기 위한 이온 발생부(Ionizer High voltage drive circuit Control Block)(91); Additional anion generating function and the ion generating unit (Ionizer High voltage drive circuit Control Block) (91) for injecting antimicrobial spray for bacterial eradication; 2차코일(80)과 연결되는 충전용 배터리팩(200) 측의 무선 충전 모듈이 내장된 휴대용 단말기를 부하 변조(Load regulation)를 통하여 1차코일(70)의 충전 모듈의 MPU 블록(30)에서 충전용 배터리팩(200)의 ID를 인식하고, 충전용 배터리팩(200)의 2차정류단의 전압을 항상 정전압으로 제어할 수 있도록 무접점 충전장치(1)의 1차측 주파수 자동 가변 알고리즘을 통하여 전류 피드백에 의한 안정적인 전력 제어하기 위하여, 2차측 신호를 감지하기 위한 전류센싱블록(Current sensing block)(60); 2 MPU block 30 of the charge module of the secondary coil 80, the rechargeable battery pack 200, the side of the wireless charging module is built in the mobile terminal through the load modulation (Load regulation) 1 the secondary coil (70) connected to recognize the ID of the rechargeable battery pack 200 are in, and the primary frequency automatic variable algorithm of the non-contact charging apparatus 1, the second voltage of the secondary rectification stage of charging the battery pack 200 are always to be controlled at a constant voltage in order to control a stable power due to the feedback current, the current sensing block for sensing the secondary side signal (current sensing block) (60) through; 충전 칩의 온도를 감지하기 위한 온도보호회로부(Thermal Protection Safety Block)(92); Temperature protection circuit for sensing the temperature of the charging chip (Thermal Protection Safety Block) (92); 충전용 배터리팩(200)인 2차측 신호의 피드백 신호를 감지한 1차코일(70)과 연결되어 2차측 신호를 검출하는 신호검출블록(61) 등을 포함한다. Is connected to the rechargeable battery pack 200, a second primary coil 70. The temperature of the feedback signal of the primary signal comprises a signal detecting block 61, etc. for detecting a secondary signal. 그리하여 휴대용 단말기(300)는 상기 구성의 무접점 충전장치(1)를 USB 통신의 허브로 하여, 컴퓨터(PC) 또는 노트북(100)으로부터 음악, 동영상, 데이터 등을 전송받을 수 있으며, 나아가 컴퓨터 또는 노트북(100)에서 휴대용 단말기(300)를 제어할 수 있는 것이다. Thus, the mobile terminal 300 is in a non-contact charging apparatus 1 of the above structure in the USB communication hub, and receive downloads of music, video, and data from the computer (PC) or a laptop 100, a further computer or in the laptop 100 is capable of controlling the portable terminal 300. 이를 위해 USB커넥터(10)와 연결된 USB드라이버블록(20)은 송수신되는 데이터를 USB 프로토콜로 에뮬레이션하며, USB드라이버블록(20) 및 MPU블록(30)에 의해 1차코일(분리형 변압기: FPCB, PCB, Coil, Ferrite core로 구성된 변압기)(70)에서 신호를 무선으로 휴대용 단말기(300) 또는 충전용 배터리팩(200)에 전송한다. To this end, the USB connector 10 and USB driver block 20 connected shall emulation data to be transmitted and received with the USB protocol, the primary coil by the USB driver block 20 and the MPU block 30 (separate transformers: FPCB, PCB , the signal at the transformer) 70 consisting of Coil, Ferrite core wirelessly transmits to the portable terminal 300 or the rechargeable battery pack 200 for a. 이에 1차코일(70)과 마찬가지로 충전용 배터리팩(200)의 2차코일(분리형 변압기: FPCB, PCB, Coil, Ferrite core로 구성된 변압기)(80)에서 전송된 데이터 신호를 수신하여, FSK(Frequency Shift Keying, 주파수 편이 방식)를 통하여 신호를 분리하고, 이 데이타를 휴대용 단말기(300)의 저장매체(메모리)에 데이터를 저장하며, 이에 USB 컨트롤러(301)를 구비할 수 있어 이를 통하여 데이터를 저장할 수 있다. Thus, like the primary coil 70, secondary coil of the rechargeable battery pack (200) for: receiving a data signal transmitted from the (removable transformer FPCB, PCB, Coil, the transformer consisting of Ferrite core) (80), FSK ( frequency shift Keying, frequency shift separate the signals over the system), and the data and the store data to the storage medium (memory) of the portable terminal 300, and thus can be provided with a USB controller 301, the data through which It can be saved. 이에 더하여 무접점 충전장치(1)가 가동하는 중에, 충전용 배터리팩(200)의 2차측 무선 충전모듈이 내장된 충전용 배터리팩(200) 또는 휴대용 단말기(300)를 상기 무접점 충전장치(1)에 근접시키면, 자동으로 컴퓨터 또는 노트북(100)에서 동기화되어 USB 통신으로 자동 접속되고, 휴대용 단말기(300)의 경우 저장매체 폴더가 팝업되어 음악(MP3 format), 동영상(avi, asf, dat format), 데이터 등을 무선으로 컴퓨터 또는 노트북(100)에서 업로드 및 다운로드 할 수 있다. In addition, non-contact charging apparatus (1) during operation, wherein the secondary side wireless charging module is a built-in rechargeable battery pack 200 or the portable terminal 300, for the rechargeable battery pack 200 for a non-contact charging apparatus ( If close to 1), are synchronized automatically in a computer or laptop 100 is automatically connected to the USB communication, in the case of the portable terminal 300 is a storage medium folder pop-music (MP3 format), video (avi, asf, dat the format), data such as the air can be uploaded and downloaded from the computer or laptop 100. 즉 컴퓨터 또는 노트북(100)과 연결된 무접점 충전장치(1)는 일정한 인터벌을 두고 1차코일(70)로 하여 펄스를 발신하여 충전용 배터리팩(200)의 접속 여부를 감지하게 된다. I.e., solid state charge associated with a computer or laptop 100 device (1) is to place a pulse at regular intervals to the primary coil 70 detects a connection whether or not the rechargeable battery pack 200 for a. 그리하여 무접점 충전장치(1)의 1차코일(70)과 충전용 배터리팩(200)의 2차코일(80) 간에 무선 데이터 통신을 할 수 있으며, 이와 별도로 상기 컴퓨터 또는 노트북(100)의 USB 포트의 전원 또는 별도의 공급전원을 충전용 배터리팩(200)에 공급할 수 있다. Thus, the non-contact charging apparatus (1) of the primary coil 70 and the rechargeable battery pack 200 is a secondary coil 80, the computer or laptop 100 can be a wireless data communication, Separately between for USB power to the port or a separate power supply can be supplied to the rechargeable battery pack 200 for a. 이러한 무접점 충전장치(1) 및 배터리팩(200) 그리고 휴대용 단말기 등의 구성은 본 발명의 출원인이 다수 출원한 기술에 의해 실시가 가능한 것이다. Configuration such as this non-contact charging apparatus 1 and the battery pack 200 and the mobile terminal is available is performed by the applicant of the present invention multiple application technique. 이와 같은 무접점 충전장치(1) 및 배터리팩(200)에 의한 충전 및 데이터 통신 방식에 더하여, 본 발명에서는 무접점 충전장치(1) 및 배터리팩(200) 그리고 휴대용 단말기 등에 전력전송 뿐만 아니라 데이터 통신도 동시에 가능하도록 구비하여, 메인 컴퓨터 또는 노트북 등의 제어장치로부터 데이터 송 수신 및 기능의 제어 그리고 상태 감시 등이 용이하게 할 수 있도록 구비한 것이다. In addition to the same non-contact charging apparatus 1 and the charging and the data communication method according to the battery pack 200, a power transmission, as well as like the present invention, the non-contact charging apparatus 1 and the battery pack 200 and the mobile terminal data and provided so as to also be at the same time communication, and the like having to control and monitor the status of data transmission and reception function from the control device such as a main computer or laptop can be easily performed. 그리고 전류센싱블록(60)에 의하여 감지된 2차코일(80)로부터의 신호가 휴대용 단말기(300)가 구비되지 않는 것으로 판별되거나, 음악(MP3 format), 동영상(avi, asf, dat format), 데이터 등을 수신할 수 있는 메모리가 함께 구비되지 않은 것으로 판별되는 신호로 수신될 경우에는, MPU블록(30)의 제어에 의하여 1차코일(70)로 USB 데이터(음악(MP3 format), 동영상(avi, asf, dat format), 데이터 등)의 전송을 하지 않도록 하기 위하여, USB데이터전송제어모듈(25)을 USB드라이버블록(USB Emulation Control Block)(20)에 더 구비하며, 이에 의하여 휴대용 단말기가 접속된 것으로 판명되면 다시 데이터를 전송할 수 있다. And or a signal from the secondary coil 80 is sensed by the current sensing block 60 is determined as not being provided with a portable terminal (300), music (MP3 format), video (avi, asf, dat format), when the memory data and the like can be received to be received into a signal which is determined to be not provided with include, MP3 format (USB data (music as the primary coil 70 by the control of the MPU block 30), video ( in order to avoid the transmission of avi, asf, dat format), data, and so on), further comprising a USB data transfer control module 25 to the USB driver block (USB Emulation control block) (20), whereby the mobile terminal If it is found that the connection may transmit the data again. 그리하여 1차코일(70) 및 2차코일(80)은 전력전송 및 전력전송에 필요한 데이터가 전송되도록 하며, 또한 컴퓨터 또는 노트북에 이에 알맞은 신호를 전송하도록 구비할 수 있다. Thus the primary coil 70 and secondary coil 80, and that the data transfers needed for power transmission and power transmission, may also be provided to transmit this signal to the appropriate computer or laptop. 이에 무접점 충전장치(1)의 MPU블록(30)의 제어에 의하여 직렬공진 컨버터(50) 및 1차코일(70)과 2차코일(80)을 통하여, 무접점 충전장치(1)의 펄스신호에 대한 응답으로 충전용 배터리팩(200) 또는 휴대용 단말기(300)에서는 고유의 ID를 발생하여 다시 무접점 충전장치(1)로 전송하게 된다. In the non-contact charging apparatus 1 of the MPU block 30, series resonant converter 50 and a primary coil 70 and the secondary through the coil 80, the non-contact charging apparatus (1) by control of the pulse in response to the signal charge in the battery pack 200 or the mobile terminal 300 for the generation of a unique ID and transmits back to the non-contact charging apparatus (1). 즉 충전용 배터리팩(200) 충전제어부(210)의 2차측 무선 충전 모듈이 내장된 ID칩에서 고유 ID 신호를 2차코일(80)을 통하여 발신하게 되면, 무접점충전장치(1)에서는 1차코일(70), 신호검출블록(61), 전류센싱블록(60)을 통하여, 공급되는 전력신호의 부하변조(Load regulation) 신호를 통하여 충전용 배터리팩(200) 또는 휴대용 단말기(300)의 고유 ID를 인식하게 된다. That is, when the specific ID signal from the ID chip, the secondary side wireless charging module's built-in rechargeable battery pack 200, charging control unit 210 to the calling via the secondary coil 80, the non-contact charging apparatus (1) of the secondary coil 70, the signal detecting block 61, through the current sensing block 60, the load modulation of the power signal to be supplied (load regulation), the rechargeable battery pack 200 or the handy terminal 300 for through the signal It recognizes the unique ID. 이와 같이 인식된 충전용 배터리팩(200) 또는 휴대용 단말기(300)의 고유 ID를 인식하게 되면, 이러한 충전용 배터리팩(200) 또는 휴대용 단말기(300)에 대한 정보는 컴퓨터 또는 노트북(100)에 전송하게 된다. Once aware of the unique ID of the charged battery pack 200 or the mobile terminal 300 for recognition in this manner, a computer or laptop 100, information on these rechargeable battery pack 200 or the portable terminal 300, for It transmits. 즉 상기 무접점 충전용 배터리팩(200)이 상기 무접점 충전장치(1)에 올려지면 충전용 배터리팩(200)에 내장된 ID칩이 동작하여 무부하 상태에서 로드 레귤레이션을 하여 충전 스타트 ID를 무접점 충전장치(1)에 전송하고, 상기 무접점 충전장치(1)는 그 신호를 피드백 받아서 ID가 일치하여 올바른 신호인지를 확인하고 일치하면 풀 파워모드로 전력을 충전용 배터리팩(200)에 공급한다. That is, the non-contact charging battery pack 200 is in the load regulation at no load to the ID chip the operation built in the non-contact charging apparatus 1, the battery pack 200 when the charging up to the non-charge-start ID a contact charging device transmitted in (1), the contactless charging apparatus 1 to the ID receiving feedback the signal match, determine whether a valid signal and matching full power mode, the rechargeable battery pack 200 for power to supplies. 그리고 충전용 배터리팩(200) 또는 휴대용 단말기(300)의 고유 ID가 인식되면, 1차코일(70) 및 2차코일(80)을 통하여 충전용 배터리팩(200) 또는 휴대용 단말기(300)의 2차측 정류단 전압을 항상 정전압 제어를 한다. And a rechargeable battery pack 200 or the portable when the unique ID of the terminal 300 recognizes, the primary coil 70 and the secondary coil charges the battery pack 200 or the handy terminal 300 for through (80) the secondary side is always a constant voltage control for voltage rectification stage. 이는 무접점 충전장치(1)의 1차 측 주파수 자동 가변 알고리즘을 통하여 충전용 배터리팩(200) 또는 휴대용 단말기(300)의 2차측 충전 전력을 제어한다. This controls the secondary-side charging power of the contactless charging apparatus (1) of the primary-side frequency automatically charging the battery pack 200 or the portable terminal 300 via the variable for algorithms. 이러한 충전 전력 제어를 보면, 무접점 충전장치(1)의 1차코일(70), 신호검출블록(61), 전류센싱블록(60)에서는 Vdrop(= Vrec - Vbat)에 의한 2차측 소비전력[Pdis=(Vrec-Vbat)*Ichg]을 최소화하도록 구비된다. In such a charging power control, fog in the contact point the primary coil 70, the signal detecting block 61, the current sensing block 60 of the filling device (1) Vdrop (= Vrec - Vbat) 2 side power consumption by the [ Pdis = (Vrec-Vbat) * Ichg] is provided to minimize. 이에 Vrec은 2차측 입력전압이 되는 2차측 정류회로(81)의 출력 전압(도 1의 상부 우측에 도시됨)이고, Vbat는 2차측 최종 충전 소비 전압이 되는 2차측 충전용 배터리팩(230)의 배터리 전압(도 1의 하부 우측에 도시됨)이며, Vdrop는 2차측에 있어 입력 전압(즉 Vrec)에 대한 충전 소비 전압(즉 Vbat)의 차이의 전압이 되며, Ichg는 2차측에 인가되는 전류이고, Pdis는 2차측에서 충전에 소비되는 전력이다. The Vrec is the outlet side (as shown in upper right side of Fig. 1) the output voltage of the secondary side rectification circuit 81 are the input voltage and, Vbat is the secondary-side end secondary side charging battery pack 230 is charged consumption voltage the battery voltage (shown in the lower right side of Fig. 1 being) and, Vdrop is in the secondary side, and the voltage difference between the input voltage charge consumption voltage (i.e., Vbat) for (i. e. Vrec), Ichg is applied to the secondary side current and, Pdis is the power consumed on the secondary side to charge. 이와 같은 정보는 2차측 배터리팩에서 1차측 무접점충전장치(1)로 신호전송되어 전력제어하게 되는 것이다. Such information is transmitted signal in the primary non-contact charging apparatus 1 in the secondary battery pack to which the power control. 따라서 충전용 배터리팩(200) 또는 휴대용 단말기(300)에서 별도의 2차측 충전모듈의 부재를 줄일 수 있고, 기타 충전칩들의 온도 상승을 억제하며, 이로써 복잡하고 가격이 비싼 스위칭 충전용 IC를 사용하지 않고 리니어 충전용 IC를 사용할 수 있으며, 또한 배터리 팩의 내부 공간을 확보할 수 있다. Therefore, use a separate secondary side it is possible to reduce the members of the charging module, the other, and suppressing the temperature increase of the charging chip, whereby IC for complicated and charge expensive switching in charging the battery pack 200 or the portable terminal 300, for you can use the IC for linear charging without, and may also be secured to the inner space of the battery pack. 다음으로 살펴볼 수 있는 것은 충전모듈을 구비하지 아니한 이종의 금속체가 무접점 충전장치(1) 위에 올려졌을 때, 유도기전력에 의하여 이러한 이종의 금속체가 와전류에 의한 손실이 열로 발생하여 과열이 되어, 무접점 충전장치(1)가 손상되는 현상이 발생될 우려가 있다. The next is to look to the turned up over contactless charging apparatus (1) body of metal of different types of other than those provided with a charging module, is the overheating and loss of the heat generated by the metal body is an eddy current in these two kinds by the induced electromotive force, no there is a fear that the phenomenon in which the contact charging device (1) damage to occur. 이러한 현상은 유도기전력을 이용한 무접점 충전장치(1)의 안정성에 가장 큰 영향을 미치는 문제이다. This phenomenon is a problem has the greatest effect on the stability of the non-contact charging apparatus (1) using an induced electromotive force. 그러므로 동전, 금속펜, 가위, 등 생활 속의 금속체 등, 충전모듈이 구비되지 아니한 이종의 금속체를 인식하고 전력을 차단하여 과열의 위험으로부터 안전하도록 하는 안전장치를 반드시 구비하여야만 한다. It should be therefore be provided with a safety device for coins, metal pens, scissors, and the like living in the metal body, the recognition of the different metal element which is not provided with the charging module, and interrupt the power to be safe from the risk of overheating. 이를 위한 구성을 살펴보면, 1차코일(70)에서 2차코일(80)에 전력을 전달시키는 수단은 반파 또는 전파형 직렬/병렬 공진형 컨버터를 사용하여 LC공진을 시켜 전류를 정현파로 만들어 유도결합에 의해 2차 측에 전력을 전달하는 것이다. Looking at the structure for this, the primary means for delivering power to the secondary coil 80 in the coil 70 is inductively coupled to create a current to the LC resonance by the sine wave using a half-wave or radio wave type series / parallel resonant converter by to transfer power to the secondary side. 이때 스위칭 주파수는 공진주파수 보다 높게 설정하여 소프트 스위칭이 되도록 한다. The switching frequency is such that the soft-switching to set higher than the resonant frequency. 1차코일(70)에서 일정한 인터벌(interval)을 두고 아주 짧은 시간 동안 PWM펄스를 인가하여, 이종의 이물질이 올려져 있는지 여부를 감지하여 판별하는 매카니즘을 구성한 것이다. Applying a primary coil (70) PWM pulse for a short time at regular intervals (interval) from, a mechanism is configured to determine to detect whether there is a foreign matter heterologous raised. 무부하시 스위칭 주파수와 전류의 위상이 항상 90도를 이루는데, 이물질이 근접되면 자기 인덕턴스의 변화에 의해 전류의 위상이 변화되고, 이 위상차의 레벨에 따라 이물질의 정도를 인식하도록 하였다. It the phase of the no-load switching frequency and a current is always made to 90 degrees, when the foreign object is close and the change in phase of a current by a change in magnetic inductance, and to recognize the amount of foreign matter according to the level of the phase difference. 즉 물체 근접이 감지되면 전력을 인가하는 일정시간 동안 ID 체크 신호를 발신하여, 궤환된 고유 ID 신호가 감지되지 않거나 또는 상이한 ID가 인식이 되면, 이물질로 인식하여 무접전 충전장 치(1)의 충전 시스템을 shut-down 시켜 충전 전력을 1차코일(70)로 공급되지 않도록 하여, 충전용 배터리팩(200) 또는 휴대용 단말기(300)의 충전회로의 안정성을 확보한 것이다. That is an object proximity is detected by emitting a predetermined time ID check signal while applying power, when the feedback unique ID signal not detected or different ID is recognized, the recognized as foreign matter in the non-engaged charging device (1) to the filling system shut-down so as not to supply the charging power to the primary coil 70, which will ensure the stability of the charging circuit of the rechargeable battery pack 200 or the handy terminal 300 for. 즉 무점접 충전장치(1)에서는 상기 1차코일(70)에서 일정한 인터벌의 PWM펄스를 발생하고, 이에 응답하는 상기 2차코일(80)로부터의 신호를 상기 전류센싱블록(60)에서 감지함에, 감지된 신호가 규정된 신호이면 ID를 부여하여 데이터 신호 및 전력신호를 전송하며, 응답이 없거나 응답신호가 규정된 신호가 아니면 이물질로 감지하여 데이터 신호 및 전력 신호의 전송을 중지하는 이물질 감지기능을 더 포함하여 구성한 것이다. I.e. as mujeom contact charging apparatus (1) In the above first generates a PWM pulse of a predetermined interval in the primary coil 70 and, in response the secondary coil 80 is detected by the current sensing block 60, the signals from which , when the the detected signal defined signal assigned the ID to detect foreign material which transmits the data signal and the power signal, the response or the response signal is stopped, the transmission of a signal, or detected as a foreign matter by a data signal and a power signal specified function It is configured to further include a. 또한 이러한 이물질 감지기능에 의한 충전 중 이물질 감지는 복잡한 기술이 요구되는데 충전이 되면서 전력은 점점 떨어지도록 구비할 수 있다. In addition, charging foreign matter detected by this foreign matter detection function may be provided so as to charge the complex techniques are required power falls gradually. 이 전력 곡선에 히스테리시스를 두어 이물질이 올려졌을 때, 히스테리시스 구간을 넘어가면 이물질로 인식하여 shut-down시키는 알고리즘이 사용하여 구현할 수 있다. When been placed hysteresis up of foreign materials on the power curve, and goes beyond the hysteresis region recognized as foreign matter it can be implemented by an algorithm that shut-down use. 본 발명은 상기 무접점 충전장치(1)의 안전장치와 무선충전용 모듈이 내장된 충전용 배터리팩(200)의 안전성 및 배터리 상태 감시기능을 갖춘 무선 충전 솔루션을 제공할 수 있다. The present invention can provide a wireless charging solution, with the safety and the battery state monitoring function of the contactless charging apparatus (1) Security devices and the wireless charging module is built-in rechargeable battery pack 200 for the. 그리고 상기 무접점 충전장치(1)는 기본적으로 온도보호회로부(92)에 의하여 1차코일(70)과 구성된 여러 칩의 온도를 검출하거나 장치몸체(2) 내부의 온도를 감시하여, 상시 온도가 45℃ 이상일 경우, Shut-down시키는 기능과, 과전류, 과전압에 대한 보호 기능을 칩에 내장하고, 또한 퓨즈(Fuse)를 내장하여 과전류를 차단한 다. And the contactless charging apparatus (1), by default, detect the primary coil 70 and the temperature of the various chips is configured by the temperature protection circuit 92, or by monitoring the temperature in the apparatus body 2, normally the temperature is If more than 45 ℃, and a built-in function of protection against over-current, over-voltage to Shut-down on the chip, and also a built-in fuse (fuse) to block over-current. 그리고 상기 무접점 충전장치(1)의 구성 칩의 기능이 마비되어 이상신호가 검출되면 회로를 차단하며, 1차코일(70)과 연결된 CL 공진부에 직렬로 바이메탈(Bimetal)(71)을 구성하여 1차코일(70)이 과열되었을 때 회로를 차단할 수 있도록 하는 등, 안전장치를 구성하였다. And configuring the bimetal (Bimetal) (71) in series with the free when the contact charging device (1) is a function of the configuration chip failure over signal is detected from, the circuit-breaker, CL resonance unit connected to the primary coil (70) to, and configure the safety device, such as to block a circuit when the primary coil (70) is heated. 그리고 부가적으로 음이온 발생기능이나 세균 박멸을 위한 향균 스프레이가 분사되고, LCD 디스플레이부(3) 또는 컴퓨터, 노트북(100) 등에 충전이 되는 상태를 표시한다. And Additionally, the antimicrobial spray for an anion generating function and bacterial eradication is injected, and shows the state in which the charge to LCD display unit 3 or the computer, a laptop 100. The 이에 더하여 충전용 밧데리(230)가 만충전되면, 충전용 IC에서 출력된 만충전 신호를 ID칩에서 받아서 만충전 상태를 충전체제어부(210)의 제어에 의해 상기 무접점 충전장치(1)에 로드 레귤레이션을 통하여 전송하고, 이 신호를 피드백 받아 충전용 배터리팩(200)이 충전 완료 상태인 것을 디스플레이부(3), 컴퓨터 또는 노트북(100) 등에 표시한다. Thus the addition when charging battery 230 for the maximum charge, takes the full-charge signal outputted from the charge IC for in the ID chip fully charged state to the non-contact charging apparatus (1) under the control of the charging system fisherman 210 transmitted through the load regulation and receives feedback of this signal indicates that the battery pack 200 for the charging completion state of charge or the like the display unit 3, a computer or laptop 100. 이러한 본 발명 무접점 충전장치(1)는 또한 도 4와 같이, 상기에 기술된 바와 같이 컴퓨터 또는 노트북 등으로 부터 USB 포트를 이용하여 전력을 충전할 수 있으며, 또한 컴퓨터 또는 노트북과 근접되지 않는 상황, 즉 여행을 하는 등과 같은 상황에서 다양한 방법으로 충전할 수 있도록 부가된 구성을 할 수 있다. The present invention non-contact charging apparatus 1 is also as shown in Figure 4, it is possible to charge the electric power by using the USB port from the computer or laptop, etc., as described above, and situations in which it does not close to the computer or notebook , that can be added to the configuration to charge a variety of ways, such as in the situation that the travel. 즉 충전기, 어댑터, USB 포트 등을 입력으로 하는 24핀 커넥터를 사용할 수 있으며, 그 일 실시예로 24핀 표준 커넥터를 사용하여 여행용 충전기가 꽂일 경우, 1번 핀에 할당된 특정 ID저항을 통해 항상 4.2V를 21, 22번 핀을 통해 입력받고, 어댑터가 꽂일 경우 4, 5번 핀을 통해 전원을 입력받고, USB 포트에 꽂일 경우 16번 핀을 통 해 전원을 입력 받을 수 있으며, 상기 무접점 충전장치(1)는 입력전원이 4V에서 5.5V에서 동작 가능하도록 구비할 수 있다. I.e. charger, the adapter, it is possible to use the 24-pin connector to a standard USB port as an input, when the travel charger kkotil using a standard 24-pin connector in the embodiment, all the time through the specific ID resistor assigned to the pin 1 receiving input via the 4.2V 21, pin 22, and the adapter if kkotil receives power via the 4, 5 pin, kkotil the USB port to receive the input power source via a 16-pin, the contactless filling apparatus 1 can be provided with input power to enable operation at 5.5V at 4V. 그리고 상기 24핀 표준 커넥터를 사용하는 어댑터를 사용하여 2개의 휴대용 단말기를 동시에 충전시킬 수 있는 도킹 스테이션을 구성하여 상기 무접점 충전기를 2개 연결하여 각각 휴대용 단말기 2대를 동시에 충전시킬 수도 있다. And it may be charged respectively to the mobile terminal 2 at the same time by connecting the two non-contact charger to configure the docking station capable of charging the two portable terminals at the same time by using adapters that use the standard 24-pin connector. 상기와 같이 구성된 본 발명의 다른 실시를 살펴보면 다음과 같다. Referring to another embodiment of the present invention configured as described above are as follows. 즉 컴퓨터 또는 노트북(100)과 USB 통신하는 상기 USB드라이버블록(20)을 USB에 대한 컨트롤러 기능뿐만 아니라, IrDA 신호로 변환하는 기능을 부가한 것이다. In other words, as well as the controller functions for the USB computer or laptop 100 and the USB communication with the USB driver block 20, which will add a function to convert IrDA signal. 따라서 이러한 USB드라이버블록(20)은 USB프로토콜 및 IrDA로 서로 변환하는 IrDA 신호변환부(21)를 더 구비하고, 상기 IrDA 신호변환기(21)에 의해 IrDA로 변환된 데이터 신호를 상기 MPU 블록(30)의 제어에 의해 상기 휴대용 단말기(300)와 서로 송수신하는 IrDA 포트(22)를 더 구비하고, 휴대용 단말기(300)의 IrDA 컨트롤블록(302)으로부터 발신되어 IrDA 포트(22)에서 수신된 상기 휴대용 단말기(300)의 고유ID를 감지하여 구별하는 휴대용단말기ID 감별부(미도시됨)를 더 구성하였다. Therefore, this USB driver block 20 has the MPU block the data signal converted to the IrDA by the IrDA signal converter further comprising: a (21), and the IrDA signal converter 21 for converting to each other with a USB protocol and IrDA (30 ) of the portable further includes the IrDA port 22 to send and receive each other and said portable terminal (300) by a control, and is transmitted from the IrDA control block 302 of the mobile terminal 300 received from the IrDA port 22 on the the terminal mobile terminal ID to distinguish the determining part to detect the unique ID of 300 (not shown) and further configurations. 이에 도 2 및 도 3은 본 발명에 따른 IrDA 송수신 모듈이 내장된 무접점 충전장치(1)를 나타낸 도면이다. In Figure 2 and Figure 3 is a view of the contactless charging apparatus (1) the IrDA transceiver module built in accordance with the present invention. 이를 참조하면, 상기 무접점 충전장치(1)는 전원입력으로 컴퓨터나 노트북(100)의 USB포트에 연결하면, 상기 무접점 충전장치(1)에 내장된 IrDA 신호변환 부(21)에 의해 USB 통신프로토콜 및 IrDA 등의 데이터를 상호 변환하고, IrDA 트랜시버를 통하여 PC 또는 노트북으로부터 저장된 음악, 동영상, 데이터 등을 연동하여 휴대용 단말기(300)(휴대폰, PDA, PMP, DMB단말기, MP3 등)와 데이터를 무선으로 상호 교환할 수 있다. Referring to this, by the non-contact charging apparatus 1 when the power supply input connected to the USB port of the computer or laptop 100, the IrDA signal conversion section 21 incorporated in the contactless charging apparatus (1) USB communication protocols and by translating the data, such as IrDA, and interlocking of music, video, and data stored from the PC or laptop via the IrDA transceiver mobile terminal 300 (mobile phone, PDA, PMP, DMB terminals, MP3, and so on) and data the exchange can be wirelessly. 물론 전원 공급용 전력의 전송을 1차코일(70) 및 2차코일(80)에 의한 비접촉 분리형 변압기를 이용하여 상기 휴대용 단말기(300)로 에너지를 전달하여 배터리를 충전한다. Of course, by using a non-contact transformer removable by the transmission of power for supplying power to the primary coil 70 and secondary coil 80 transfers energy to the portable terminal 300 charges the battery. 상기 무접점 충전장치(1)에 내장된 IrDA 포트(22)와 상기 휴대용 단말기(300)의 IrDA포트를 일치시켜 2차측 무선 충전모듈이 내장된 휴대용 단말기(300)를 상기 무접점 충전장치(1)에 근접시키면, 상기 무접점 충전장치(1)는 상기에 언급된 바와 같은 기술의 1차코일(70) 및 2차코일(80)에 의해 자동으로 컴퓨터 본체와 동기화되며, 이에 무접점 충전장치(1)와 휴대용 단말기(300) 간에 쌍방이 적외선 통신이 가능하도록 컴퓨터 또는 노트북(100)에 USB가 자동으로 접속되며, 따라서 휴대용 단말기(300)의 저장매체 폴더가 팝업되고 음악(MP3 format), 동영상(avi, asf, dat format) 등 데이터를 무선 다운로드할 수 있으며, 기타 데이터 처리를 함께 할 수 있는 것이다. The contactless charging apparatus (1) the IrDA port 22 and by matching the IrDA port of the portable terminal 300, the secondary-side wireless charging module is built in the portable terminal charging the contactless a 300 device (1 incorporated in ) when close to, and synchronized with the contactless charging apparatus 1 is an automatic computer main body by the primary coil 70 and secondary coil 80 of the technique as mentioned above, whereby non-contact charging device 1 and the two sides between the portable terminal 300, and USB is automatically connected to a computer or laptop 100 to enable the infrared communication, and therefore the storage media folder of the portable terminal 300, a pop-up, and music (MP3 format), video (avi, asf, dat format) including the data to the radio and download, is to do with the other data processing. 이에 도 3은 이러한 무접점 충전장치(1) 및 휴대용 단말기(300) 간에 각각 내장된 IrDA 포트에 의한 적외선 통신 방식과 전력을 전달하는 무접전 충전장치(1)에 대한 구성도를 도시한 것이다. In Figure 3 illustrates a block diagram of the non-engaged charging equipment 1 for transmitting infrared communication scheme and the power due to the IrDA port built respectively between these non-contact charging apparatus 1 and the portable terminal 300. 즉 도 3의 상기 무접점 충전장치(1)는 USB 커넥터(USB Connector)(10), USB-to-IrDA로 신호변환하는 IrDA 신호변환부(21)가 내재된 USB드라이버블록(20), MPU 블록(30), 부츠트랩 게이트 드라이버(Bootstrap Gate Driver)를 포함하는 게이트 드라이브 블록(Gate Drive Block)(40), LLC 풀브릿지 직렬 공진 컨버터(LLC Full-bridge Serial Resonator Converter)의 직렬공진 컨버터(50), 1차코일(70), 2차코일(80), 바이메탈(Bimetal)(71), 먼지냄새 센서(Dust & Smell Sensor Circuit)(90), 이온 발생부(Ionizer High voltage drive circuit Control Block)(91), 전류센싱블록(Current sensing block)(60), 온도보호회로부(Thermal Protection Safety Block)(92), 및 2차측 신호를 검출하는 신호검출블록(61) 등을 포함한다. That is, the non-contact charging apparatus 1 of Fig. 3 is a USB connector (USB Connector) (10), the USB driver block 20 has inherent IrDA signal conversion section 21 for converting the signal to a USB-to-IrDA, MPU block 30, a boots trap gate driver (Bootstrap gate driver) gate drive block including (gate drive block) (40), LLC full bridge series resonant converter (50 in the series resonant converter (LLC Full-bridge serial resonator converter) ), the primary coil 70, secondary coil 80, a bimetal (bimetal) (71), dust smell sensor (dust & smell sensor circuit) (90), the ion generating unit (Ionizer High voltage drive circuit Control Block) 91, it includes a current sensing block (current sensing block) (60), a temperature protection circuit (Thermal protection Safety block) (92), and a secondary signal detecting block 61 for detecting the signal, and the like. 그리고 휴대용 단말기(300)에는 IrDA 컨트롤러(302) 및 IrDA 포트 등이 구비된다. And it is a portable terminal 300 is provided with the IrDA controller, such as 302 and the IrDA port. 그리하여 휴대용 단말기(300)와 무접점 충전장치(1) 사이에 각각의 IrDA 포트를 이용하여 데이터 통신을 하도록 구비할 수 있다. Thus it may be provided using the respective IrDA port between the mobile terminal 300 and the non-contact charging apparatus 1 to the data communication. 상기와 같이 구성된 본 발명의 무접점 충전장치(1)와 결합되어 무접점 충전장치(1)와 서로 데이터를 무선으로 송수신하며, 전원용 전력을 무선으로 공급받는 충전용 배터리팩(200)을 구성한 것이다. 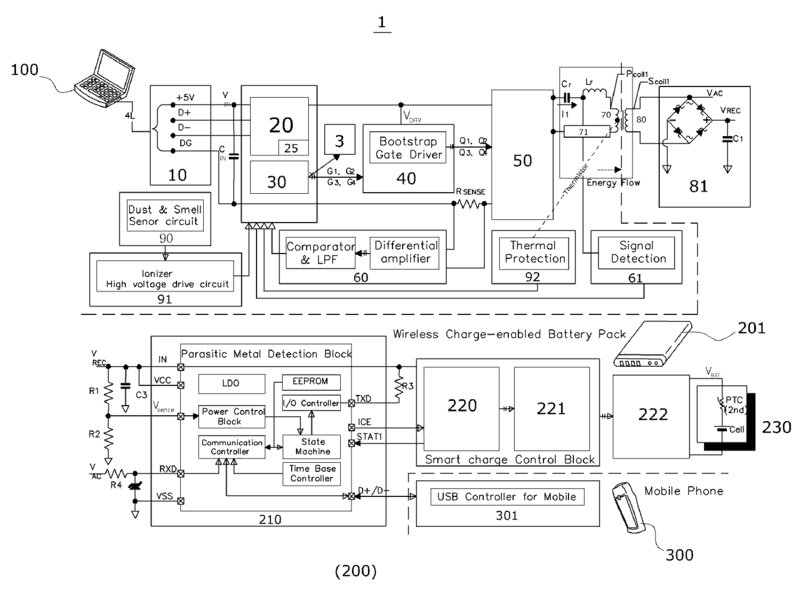 It will configure the non-contact charging apparatus (1) in combination with the non-contact charging apparatus 1 and the charged battery pack for receiving one another and transmit and receive data over the air, supplying a power supply electric power to the radio 200 of the present invention constructed as described above . 즉 상기의 무접점 충전장치(1)의 장치몸체(2) 일측과 서로 접촉가능하도록 하며, 상기 1차코일(70)과 비접촉 상태에서 자기장에 의해 데이터 신호를 송수신하고, 전력 신호를 전송받는 상기 2차코일(80)이 일측에 구성된 충전체몸체(201), 상기 충전체몸체(201) 내부 일측에 상기 2차코일(80)과 연결되어 상기 1차코일(70)로부터 전송되는 전력 신호를 처리하여 충전용 밧데리(230)에 전송하며, 상기 1차코일(70)과 송수신하는 데이터 신호를 처리하는 충전체제어부(210), 상기 충전체제어부(210)의 제어에 의하여 상기 충전용 밧데리(230)에 충전용 전력을 전송하도록 하는 충전회로(220)을 포함하며, 상기 충전회로(220)은 상기 충전용 밧데리(230)의 전원을 상기 휴대용 단말기(300)로 공급되도록 구성한 것이다. That is the above non-contact charging apparatus 1 of the apparatus body 2, and one end and to be in contact with each other, the primary coil 70 and send and receive data signals by the magnetic field in a non-contact manner, transmission receives the power signal 2, the primary coil 80 is connected to the filler body 201, the secondary coil 80 to the inner side of the filler body (201) is configured on one side of the power signal transmitted from the primary coil 70 processed, and transmitted to the charging battery 230, the primary coil 70 and the charging battery for by the control of the charging system for processing data signals for transmitting and receiving a fisherman 210, the filling system fisherman 210 ( 230) includes a charging circuit 220 for transmission to the charging electric power, the charging circuit 220 is configured to supply the power to the battery 230 for the charging to the portable terminal 300. 이에 상기 충전체제어부(210)는 상기 무접점 충전장치(1)로부터 최초 연결된 것을 감지하면 고유ID를 상기 2차코일(80) 및 상기 1차코일(70)을 통하여 상기 무접점 충전장치(1)로 전송하도록 하는 고유ID부(고유 ID 칩), 상기 충전용 밧데리(230)의 충전 정도를 감지하여 상기 무접점 충전장치(1)로 전송하는 충전감지부를 포함하여 구성한 것이다. In the charging system fisherman 210 the contactless charging apparatus 1 first detects that connected the contactless a unique ID through the secondary coil 80 and the primary coil 70, the charging device (1 from ) is configured as a unit including a unique ID (unique ID chip), the sense charge to be transmitted to the contactless charging apparatus 1 by detecting the charge level of the battery 230 for charging the parts to be transferred. 그리고 상기 충전체몸체(201)는 상기 휴대용 단말기(300)와 분리 및 체결이 가능하도록 별체로 형성되는 분리형팩으로 구성될 수 있다. Further, the filler body 201 may be of a detachable pack to be formed separately to enable the portable terminal 300, and the separation and fastening. 또한 상기 휴대용 단말기(300)의 본체 케이스 내부에 내재되어 일체로 형성되는 일체형팩으로 구성될 수 있다. Also inherent in the case body inside of the portable terminal 300 may be of a one-piece pack are integrally formed. 이에 분리형팩으로 구비된 충전체몸체(201)는 상기 충전체제어부(210)의 제어에 의하여 상기 충전용 밧데리(230)의 전원을 상기 휴대용 단말기(300)로 공급하는 터미널 블록(240)을 더 구성하였다. In the filler body having a detachable pack 201 is more a terminal block 240 to be supplied to the portable terminal 300, the power of the charged battery 230 for by the control of the charging system fisherman 210 It was constructed. 이를 도 1 및 도 3으로 하여 설명하면, 상기 충전용 배터리팩(200)의 2차코일(80)은 휴대용 단말기의 풀브릿지 정류회로(Rectification Block)(81)와 연결된다. If this description also set to a 1 and 3, the secondary coil 80 of the charged battery pack 200 is for connection with the full-bridge rectifier circuit (Rectification Block) (81) of the mobile terminal. 그리고 정류회로(81)와 연결된 충전체제어부(210)는 상기 휴대용 단말기(300) 또는 충전용 배터리팩(Wireless charge-enabled Battery Pack)(200)의 고유 ID를 송출하여 무접점 충전장치(1)에서 이물질 감지기능이 수행되도록 하고, 충전 상태 피드백 충전 회로를 on-off하고 이를 무접점 충전장치(1)로 송출하며, 신호-to-USB 변환 기능이 가능하도록 구비될 수 있다. And a rectifier circuit 81 and the charging system fisherman 210 non-contact charging apparatus (1) sends out the unique ID of the portable terminal 300 or the rechargeable battery pack for (Wireless charge-enabled Battery Pack) (200) connected foreign matter detection to be performed in, and may be provided with a charge status feedback charging circuit on-off and that it can be solid state and sent out to the charging apparatus 1, the signal -to-USB conversion. 그리고 충전을 위한 충전회로(Charge Management Block)(220), 배터리 용량 체크 회로(Fuel Gauge Control Block)(221), 배터리 보호회로(Prototection Control Block)(222), PTC와 충전용 밧데리(230), 및 휴대용 단말기(300)에 내장된 USB 컨트롤러(301) 또는 IrDA 컨트롤블록(302) 등을 함께 구비할 수 있다. And a charging circuit (Charge Management Block) for charging 220, a battery check circuit (Fuel Gauge Control Block) (221), the battery protection circuit (Prototection Control Block) (222), for PTC and the charging battery 230, and the USB controller 301 or IrDA control block 302 built in the portable terminal 300 may be provided with the like. 그리고 상기에 기술된 무접점 충전회로(1)의 안전장치와 같이, 충전용 배터리팩(200)에도 다수의 안전장치를 구비한다. And it is also provided with a plurality of safety devices such as safety devices, a battery pack 200 for the charging of a non-contact charging circuit (1) described above. 즉 충전용 배터리팩(200)의 안전장치는 충전회로에 내장된 온도센서가 있어서 외부에 연결된 NTC가 온도변화에 따라 저항값이 변동되어 분배된 전압을 피드백 받아, 기 설정된 온도 이상이 되면 충전을 차단하는 기능을 내장할 수 있다. In other words safety devices for charging battery pack 200 for the charging when the received feedback of the temperature sensor is in is the NTC connected to the outside and the resistance value changes in response to temperature changes distribution voltage incorporated in the charging circuit, group more than the set temperature It can be built in a function to be blocked. 또한 PCM이라는 보호회로에 의해 과전류, 과전압, 과방전, 단락 등으로부터 배터리를 보호하고 PTC 또는 바이메탈(Bimetal)을 사용하여 과전류와 온도에 의해 차단되어 충전용 배터리팩(200) 및 충전용 밧데리(230) 및 이들의 회로를 보호한다. In addition, over-current, over-voltage, over-discharge by a protection circuit of PCM, protecting the battery from the short circuit, etc., and PTC or bimetal is using (Bimetal) blocked by the over-current and temperature charging the battery pack 200 and the charging battery for (230 ) and protects these circuits. 그리고 충전용 배터리팩(200)에 내장된 ID 칩 및 다수의 칩 등에 대해, 충전 중 내부의 오동작이 발생했을 경우, 상기 무접점 충전장치(1)에 로드 레귤레이션을 통해 이러한 오작동 신호를 전송하고, 상기 무접점 충전장치(1)에서 FSK를 통해 신호를 받아서 스위칭을 차단하여 전력공급을 중단하는 메커니즘을 구비할 수 있다. And to transmit such malfunctions signals through, in the case where the internal malfunction of the charging and load regulation in the contactless charging apparatus (1) for such an ID chip and multiple-chip for charging battery pack 200 for, receiving a signal through the FSK in the contactless charging apparatus 1 may be provided with a mechanism to interrupt the power supply to block switching. 그리고 이러한 충전용 배터리팩(200)은 도 5 내지 도 9도와 같이, 휴대용 단말기(300) 내부에 함께 내재하여 일체로 구비할 수 있으며 또한 별체로 분리 및 결 합이 용이하게 구비할 수 있다. And these rechargeable battery pack 200 for the As shown in Fig. 5 to 9, may be provided integrally with the embedded inside the mobile terminal 300 and may also be provided to facilitate the disconnect and connect separately. 따라서 이러한 휴대용 단말기(300)는 충전용 배터리팩(200)의 터미널 블록(240)과 전기적으로 접촉되어 전원을 공급받는 전력수신터미널블록(310)과, 상기 전력수신터미널블록(310)과 연결되어 전력을 변환하는 DC/DC 컨버터(320) 및 상기 DC/DC 컨버터(320)에서 변환된 전력을 충전하는 충전블록(330)을 구성할 수 있다. Therefore, this mobile terminal 300 is connected to the terminal block 240 is electrically in contact with the powered power receiving terminal block 310, the power receiving terminal block 310 of the battery pack 200, the charging DC / DC converter 320 which converts the power and can form a charging block 330 to charge the converted electric power from the DC / DC converter 320. 이와 같은 본 발명은 일반적으로 비접촉 변압기의 경우 접촉형인 일반 변압기와 달리 큰 공극을 갖기 때문에 자화인덕턴스는 일반 변압기에 비해 상대적으로 작고, 누설인덕턴스는 상대적으로 크기 때문에 기존 직렬 공진형 컨버터를 그대로 사용하면 부하 변화에 대한 많은 순환전류가 흐르는 단점을 가지게 된다. Such When the invention is used because generally has a large air gap, unlike the general transformer type contact when the non-contact transformer magnetization because the inductance is relatively small compared to the normal transformer, the leakage inductance is relatively large as a conventional series resonant converter load many of the changes will have a circulating current flowing disadvantages. 뿐만 아니라 2차측 정류다이오드의 연속적인 전류에 의해 다이오드의 역 회복 특성에 따른 스위칭 손실이 발생할 우려가 있다. In addition, there is a fear that the switching loss due to the reverse recovery characteristics of the diode by a second continuous current of a primary side rectifier diode occur. 그러나 본 발명에서는 이러한 문제점을 개선하기 위해 비접촉 변압기용 풀브릿지 LLC 직렬 공진형 컨버터(50)를 적용하여 스위칭 주파수는 공진주파수보다 낮은 주파수에서 동작하여 기존 직렬 공진형 컨버터를 사용한 경우보다 순환전류를 많이 줄일 수 있고, 2차측 정류다이오드에 불연속 전류가 흐르기 때문에 다이오드의 스위칭 손실을 줄일 수 있는 장점을 가진다. However, a lot of circulation current than that in the present invention, by applying a full-bridge LLC series resonant converter (50) for non-contact transformer in order to solve these problems, the switching frequency is operating at a lower frequency than the resonance frequency using a conventional series resonant converter can be reduced, it has the advantage of reducing the switching loss of the diode due to the discontinuous current flow in the secondary-side rectifier diode. 또한 1차코일(70) 및 2차코일(80)은 분리형 변압기의 FPCB, PCB, 코일 및 페라이트 코어 중 어느 하나로 구성되고, 원형, 사각형 또는 다각형의 평판 또는 통형상의 코일형태로 형성되도록 하여 서로 신호 전송이 원활하도록 구비한 것이다. In addition, so as to form the coil shape of the primary coil 70 and secondary coil 80 is configured by any of the FPCB, PCB, coil and ferrite core of the separate transformers, round, square or flat of the polygonal or cylindrical one another It is equipped with a signal transmission to be smooth. 즉 올인원 하드팩의 충전용 배터리팩(200)은 2차코일과 자기장 차폐 실드, 정류회로, 충전회로(스위칭 또는 리니어 충전 회로), 무선 통신 ID 인식 회로, 보호회로, 배터리로 구성된다. That is, the rechargeable battery pack 200 for the all-in-one hard pack composed of a secondary coil and the magnetic field shielding shielding, a rectifier circuit, a charging circuit (switching or linear charging circuit), a wireless communication ID recognition circuit, the protective circuit and battery. 즉 2차코일(코일 또는 코어방식 포함)(80), 정류회로(Rectification Block)(81), LDO+ID(TX, RX통신)+FET 드라이브+배터리 충전 상태 입력(Empty, Full 신호) 기능+오실레이터+충전회로 enable 또는 disable할 수 있는 포트를 내장한 어댑터 제어 블록(Adaptor Control Block)인 충전체제어부(210), 배터리 보호회로(PCM)(222), PTC와 충전용 밧데리(230), 충전회로(220), 휴대폰과 연결되는 단자인 터미널 블록(240) 등으로 구성된다. That is the secondary winding (comprising the coil or core system) 80, a rectifying circuit (Rectification Block) (81), LDO + ID (TX, RX communication) + FET drive + battery state of charge input (Empty, Full Signal) Features + oscillator + charging circuit enable or disable the adapter control block built-in port which can (Adaptor control block) charging system fisherman 210, the battery protection circuit (PCM) (222), for PTC and charging the battery 230, the charge It consists of a circuit 220, a terminal block 240 and the cellular phone terminal to be connected and the like. 그리고 내장형 충전용 배터리팩(200)의 경우에는 상기 휴대용 단말기(300)의 케이스 커버에 2차코일과 자기장 차폐 실드를 내장하고(코일을 커버에 사출 성형하거나 보호 케이스를 만들어서 초음파 융착하는 방법 사용), 휴대용 단말기(300)와 연결될 수 있는 단자를 만들어 이 단자를 통하여 연결된 휴대용 단말기(300)의 내장 회로에 정류회로, 무선 ID 인식회로를 부가하고, 상기 휴대용 단말기(300)에 내장된 DC/DC 컨버터(320)와 충전블록(330)을 그대로 사용하여 내장된 배터리팩과 연결된 단자를 통하여 충전한다. And (using the method of making an injection molding or a protective case for the coil to the cover ultrasonic welding) in the case of built-in rechargeable battery pack 200 for the include the secondary coil and the magnetic field shielding integrated shield and the case cover of the portable terminal 300, , the make terminal that can be connected with the portable terminal 300, a rectifier circuit in the internal circuit of the portable terminal 300 is connected through this terminal, and adding the wireless ID recognition circuit and, incorporated in the portable terminal 300, DC / DC charges through a terminal coupled with the battery pack built-in to leave the converter 320 and the charge block 330. 또한 상기 휴대용 단말기(300)에 내장된 충전용 배터리팩(200)의 또 다른 구성은, 2차코일과 자기장 차폐 실드, 정류회로, 무선 통신 ID인식회로, 보호회로, 배터리 등을 휴대용 단말기(300) 케이스 커버에 융착하지 않고 내부에 내장하며, 상기 휴대용 단말기(300)와 정류회로 출력, 접지, 배터리 양극, 충전상태 핀 등의 연결 단자를 만들고 휴대용 단말기(300)에 내장된 DC/DC 컨버터(320)와 충전블록(330)를 그대로 사용하여 배터리와 연결된 단자를 통하여 충전하도록 구성할 수있다. In addition, another configuration, the secondary coil and the magnetic field shielding shielding, a rectifier circuit, a wireless communication ID recognition circuit, a protection circuit, a mobile terminal (300 a battery such as a rechargeable battery pack 200 are installed in the handy terminal 300 ) a DC / DC converter built-in and embedded within, without welding in the case cover, the portable terminal 300 and the rectifier circuit output, ground and battery positive electrode, creates a connection terminal of a charge pin portable terminal 300 ( 320) and can use the charging block 330 as configured to be charged via the terminals connected to the battery. 이러한 내장형 충전용 배터리팩(200)에 대한 회로는 도 6에 도시된 바와 같이, 휴대용 단말기(300)에 적용 가능한 무접점 충전용 세미 이너팩으로, 2차코일(코일 또는 코어방식 포함)(80), 정류회로(Rectification Block)(81), LDO+ID(TX, RX통신)+FET 드라이브+배터리 충전 상태 입력(Empty, Full 신호) 기능+오실레이터+충전회로 enable 또는 disable할 수 있는 포트를 내장한 어댑터 제어 블록(Adapter Control Block)인 충전체제어부(210), 배터리 보호회로(PCM)(222), PTC와 충전용 밧데리(230), GSM 휴대폰인 휴대용 단말기(300)에 내장된 DC/DC 컨버터(320), 및 GSM휴대폰인 휴대용 단말기(300)에 내장된 충전블록(330)을 포함하여 구성될 수 있다. As such a circuit for the integrated rechargeable battery pack 200 for the illustrated in Figure 6, the non-contact charging semi inner pack applicable to portable terminal 300, the secondary winding (comprising the coil or core system) (80 ), a rectifier circuit (rectification Block) (81), LDO + ID (TX, RX communication) + FET drive + charge type battery (Empty, Full signals) embedded function + oscillator + charging circuit enable or port to disable the adapter control block (adapter control block) charging system fisherman 210, a DC / DC built-in battery protection circuit (PCM) (222), for PTC and charging the battery (230), GSM mobile phones in the mobile terminal 300 and it may be configured including a charging block 330 is built into the converter 320, and a GSM mobile phone in the mobile terminal 300. 이때 GSM휴대폰인 휴대용 단말기(300)는 단말기에 DC/DC컨버터(320)와 충전블록(330)이 내장된 휴대용 단말기(예:GSM 휴대폰)를 말한다. Refers to: (GSM mobile phone for example). At this point, GSM mobile phones in the mobile terminal 300 includes a DC / DC converter 320 and the charging block 330 is built in the portable terminal to the terminal. 이에 무접점 충전장치(1)에 무접점 충전용 세미 이너팩, 즉 충전용 배터리팩(200)을 내장한 GSM 휴대폰인 휴대용 단말기(300)를 올려놓으면 무접점 충전장치(1)에서 전력을 발생시켜서 2차코일(80)을 통해 충전용 배터리팩(200)으로 전력을 전송한다. The contactless charging apparatus (1) non-contact charging semi the inner pack, namely Leaving the portable terminal (300) GSM mobile phone with a built-in battery pack 200, the charging generate electric power from the non-contact charging apparatus (1) thereby it transmits power to the rechargeable battery pack (200) through the secondary coil 80. 그리하여 충전용 배터리팩(200)인 2차 측에서는 2차코일(80)에서 AC 전력을 받아서 정류회로(81)에서 정류를 하여 DC로 만들고, 충전체제어부(210)에서 RXD핀을 통해 전압이 안정전압 이상( 예 : 5.5V 이상)이면 TXD핀을 통해 상기 무접점 충전장치(1)에 전력을 줄이기 위한 Power save 코드를 발생시켜 전달하여, 2차 측 전력이 안정전압(예 :5V 정도)으로 파라미터(주파수)를 조절한다. Thus, charging the battery pack 200 of the secondary side, the secondary receives the AC power from the coil 80 to create a DC by the rectification in the rectifying circuit 81, the voltage is stable over the RXD pin in the charging system fisherman 210 a voltage higher (for example:: 5.5V or more), then the TXD pin by passing the contactless generates a power save code to reduce power to the charging device (1), the secondary-side power is stable, the voltage (for example, about 5V) via to adjust the parameters (frequency). 이 경우를 반복하여 충전용 배터리팩(200)인 2차 측이 최적의 전압 조건인 안정전압(예 : 5V)이 되면 이에 대한 ID를 발생시키고, 무접점 충전장치(1)의 ID와 일치하면 상기 무접점 충전장치(1)에서 전력을 발생시킨다. If when the: (5V for example) generates an ID for it and, to match the ID of the contactless charging apparatus (1), to repeat the case of stabilizing the voltage of the secondary side of the optimum voltage condition charging battery pack 200 for to generate a power in the contactless charging apparatus (1). 그렇지 않으면 무접점 충전장치(1)에서는 전력 공급을 차단하고 절전 모드로 들어가거나 이물질이 올려졌을 경우 고유ID에 대한 수신정보가 없기 때문에 에러를 발생시켜 전력 공급을 차단한다. Otherwise, the non-contact charging apparatus (1) interrupt the power supply to interrupt the power supply to generate an error because there is received information about the unique ID if turned into or foreign objects put into sleep mode. 도 7 내지 도 9는 이러한 충전용 배터리팩(200)의 다수 실시예에 따른 분해 사시도를 도시한 것이다. 7 to 9 shows an exploded perspective view in accordance with multiple embodiments of such a rechargeable battery pack 200 for a. 우선 충전용 배터리팩(200)의 제1실시예를 도시한 도 7의 구성을 살펴보면, A/S 라벨(411), 상부 케이스(Top case)(412), 무접점 충전용 PCB 보드(413), (-)Ni-Plate(414), PTC 또는 바이메탈(415), 리드선(416), (+)Ni-Plate(417), 보조 케이스(418), Nomax 테이프(419), 정류부 보드(420), 배터리셀(421), 2차측 코일(422), 하부 케이스(Bottom case)(423), 및 라벨(424)을 구비한다. First, look at the first embodiment of the structure of illustrated Fig. 7 of the rechargeable battery pack 200 for a, A / S label 411, an upper case (Top case) (412), non-contact charging PCB board 413 for , (-) Ni-Plate (414), PTC or bimetal 415, a lead wire (416), (+) Ni-Plate (417), the secondary case (418), Nomax tape 419, the rectifying board 420 , it includes a battery cell 421, secondary coil 422, a lower case (bottom case) (423), and a label 424. 즉 정류부 보드(420)를 탑면에 배치한 실시예인 것이다. That is, YES it performed by placing the board holding portion 420 to tapmyeon. 다음으로 도 8은 제2 실시예에 따른 무접점 충전용 내장형 배터리 팩 조립도(회로기판 탑면 배치)로, A/S 라벨(431), 상부 케이스(Top case)(432), 무접점 충전용 PCB 보드(433), (-)Ni-Plate(434), PTC 또는 바이메탈(435), 리드선(436), (+)Ni-Plate(437), 보조 케이스(hot melt 방식으로 충진할 수 있음)(438), Nomax 테이프(439), 연결 보드(440), 배터리셀(441), 2차측 코일(442), 하부 케이스(Bottom case)(443), 및 라벨(444)을 구비한다. Next, Figure 8 is in the non-contact charge the internal battery pack according to the second embodiment assemble (circuit board tapmyeon arrangement), A / S label 431, an upper case (Top case) (432), non-contact charging PCB board (433), (-) Ni-Plate (434), PTC or bimetal 435, a lead wire (436), (+) Ni-Plate (437), (can be filled with a hot melt type) support case 438, it includes a Nomax tape (439), connected to board 440, a battery cell 441, secondary coil 442, a lower case (bottom case) (443), and a label 444. 그리고 도 9는 제3 실시예에 따른 무접점 충전용 내장형 배터리 팩 조립도(회로기판 측면 배치)로, A/S 라벨(451), 상부 케이스(Top case)(452), 무접점 충전용 PCB 보드(453), (-)Ni-Plate(454), PTC 또는 바이메탈(455), 리드선(456), (+)Ni-Plate(457), 보조 케이스(hot melt 방식으로 충진할 수 있음)(458), Nomax 테이프(459), 연결 보드(460), 배터리셀(461), 2차측 코일(462), 하부 케이스(Bottom case)(463), 및 라벨(464)을 구비한다. And Figure 9 is the non-contact charge the internal battery pack according to the third embodiment assemble (circuit board side arrangement) with, A / S label 451, an upper case (Top case) (452), non-contact charging PCB for board (453), (-) Ni-Plate (454), (can be filled with a hot melt method) PTC or bimetal 455, a lead wire (456), (+) Ni-Plate (457), the secondary case ( 458), provided with a Nomax tape (459), connected to board 460, a battery cell 461, secondary coil 462, the lower case (bottom case) (463), and a label (464). 상기와 같이 구비되는 배터리팩은 도 10과 같은 개략적인 구조의 자기장을 막는 차폐용 부재를 구비한다. The battery pack is provided as described above is provided with a shield member for preventing the magnetic field of the schematic structure shown in Fig 10. 이와 같은 차폐용 부재에 의하여 배터리 셀 및 충전용 회로들의 오작동을 방지하고 과열되는 것을 방지한다. This is by the same shielding member for preventing the malfunction of the battery cell and the charge circuit and prevent overheating. 즉 도 7 내지 도 9의 배터리셀(421)(441)(461)은 도 10에 개략적으로 도시된 차폐용 부재가 구비된 배터리셀(512)의 구성과 같이 구성할 수 있다. I.e., 7 to the battery cell 421, 441, 461 of Figure 9 may be configured as shown in the configuration of the battery cell 512 is provided with a shielding member as schematically shown in Fig. 즉 도 10은 무선 전력 수신 모듈을 가진 충전용 배터리팩(200)의 구성도로, 코일, 파인메탈, 박막알루미늄(호일 등), 리튬이온 또는 리튬폴리머로 된 배터리팩은 자기장을 100% 차단하기 위해 박막알루미늄을 넣어서 셀에 영향이 없도록 하여 셀의 사이클이 500회까지 충방전 가능하도록 구비한 것이다. In other words 10 is to prevent the construction road, a coil, fine metal, thin aluminum (foil, etc. ), the battery pack with lithium-ion or lithium-polymer is the magnetic field of the charged battery pack 200 for having a wireless power receiving modules 100% inserting a thin film of aluminum is equipped to enable charging and discharging to 500 cycles of the cell by eliminating the effect on the cell. 여기서 코일의 형상은 모든 형태의 코일을 포함한다. The shape of the coil may include all types of coils. 즉 사각형상, 원형상 또는 타원 형상 등으로 다양하 게 구비할 수 있다. I.e. can be varied and it comprising a rectangular shape, a circular shape or elliptical shape or the like. 그리하여 무선 전력 수신 모듈을 가진 충전용 배터리팩(200)은 배터리셀(512)의 일측에 수직 또는 수평 방향으로 무선 전력 수신회로(Wireless Power Receiver Circuits)를 구비하고, 상기 무선 전력 수신 회로(513)는 감싸는 자기장을 막는 차폐부재(501)를 포함하여 구성할 수 있다. Thus, the rechargeable battery pack 200 includes a wireless power receiver in the vertical or horizontal direction on one side of the battery cell 512, a circuit (Wireless Power Receiver Circuits), the wireless power receive circuit 513, and a for having a wireless power receiver module It may comprise a shielding member 501 prevents the magnetic field surrounding. 그리고 코일, 파일메탈, 박막알루미늄(호일 등), 리튬이온 또는 리튬폴리머로 된 충전용 배터리팩(200)은 자기장을 100% 차단하기 위해 차폐판(515)을 구비하였다. And a coil, the file metal, thin aluminum (foil, etc. ), the charged battery pack 200 for a lithium ion or lithium polymer was provided with a shielding plate 515 for blocking a magnetic field 100%. 상기 차폐부재(501) 및 차폐판(515)는 Al, Cu, Ni Alloy metal 등을 포함하여 얇은 판으로 형성된다. The shielding member 501 and the shield plate 515 is formed of a thin plate, including Al, Cu, Ni Alloy metal. 또한 상기 차폐판(515)과 동일한 구성으로 배터리셀(512)을 중심으로 하여, 전후좌우면에도 각각 차폐판(515-1)(515-2)(515-3)(515-4)를 구비하여, 자기장으로부터 배터리셀(512)을 보호하도록 구성한 것이다. Also provided with the shielding plate 515, and by loading a battery cell 512 in the same configuration, in each shielding plate (515-1), (515-2) (515-3) plane and forth (515-4) and it will configured to protect the battery cell 512 from the magnetic field. 이러한 차폐판(515)과 2차코일(516)이 권선된 충전리시버모듈(517) 사이에는 자성판(503)을 구비하여, 코일에 1차코일로부터 유도된 자기장이 2차코일(516)에 잘 유도될 수 있도록 투자율이 높은 자성체로 구비한 것이다. To this shielding plate 515 and the secondary 516 is between the winding charge receiver module 517 has to provided with a magnetic plate 503, the magnetic field induced from the primary coil to the coil secondary winding 516 to be well guided to a high magnetic permeability is provided as a magnetic material. 이러한 자성판(503)은 페라이트 계열, Mn - Zn (50 중량부 : 50 중량부), 또는 Ni - Fe (80 중량부 : 20 중량부)로 구비되거나, 파일메탈(Finemetal, Fe-Si-Cu-Nb)로 Fe를 주성분으로, 이에 Si과 B 및 미량의 Cu와 Nb를 고온 상태에서 첨가하여 100℃ 이하로 급냉하여 고체화하여 제조한 것이다. The magnetic plate 503 is ferrite series, Mn - Zn (50 parts by weight: 50 parts by weight), or Ni - Fe: or having a (80 parts by weight 20 parts by weight), the file metal (Finemetal, Fe-Si-Cu mainly composed of Fe as a -Nb), thereto is added a small amount of Si and B, and Cu and Nb at a high temperature state is produced by solidifying by rapid cooling to below 100 ℃. 그리고 차폐판(515)과 배터리셀(512) 사이에는 절연체인 절연판(502)을 구비한 것으로, 특히 NI-Cu로 된 Mesh 또는 방열할 수 있으며 열전도를 떨어뜨릴 수 있는 절연체로 구비하여, 배터리셀(512)의 온도 상승을 방지하여 과열되지 않도록 하 였다. And that between the shield plate 515 and the battery cell 512 is provided with an insulator of an insulating sheet (502), in particular to Mesh or heat a a NI-Cu, and by having an insulating material which can reduce the thermal conductivity, the battery cell It was to prevent overheating by preventing an increase in the temperature of 512. 따라서 온도와 자기장의 영향이 배터리셀(512)에 미치지 않도록 하여, 충전리시버모듈(517)과 연결되어 배터리셀의 사이클이 500회까지 충방전 가능하도록 구비하였고, 이때 코일의 형상은 모든 가능한 형태의 형상으로 하여 구성할 수 있다. Therefore, the influence of the temperature and the magnetic field so as not to the battery cell 512, was connected with the charge receiver module 517 provided to enable the cycle of the battery cell charging and discharging to 500 cycles, the image of this time the coil is in all possible forms It can be configured with a shape. 미도시된 기호 511은 (-)터미널이고, 514는 (+)터미널이며 516은 코일을 도시한 것이다. US sign 511 is shown (-) and the terminal, and 514 is (+) terminal 516, and shows a coil. 상기의 충전용 배터리팩(200)의 예에 따른 무접점 충전장치(1)는 또한 함체 형상으로 형성된 장치몸체(2)의 상부면에 1차코일(70)을 형성한 것으로, 소용돌이 형상의 원형, 사각형 또는 다각형 형상으로 코일 또는 코어의 형태로 1차코일(70)을 구성할 수 있다. Non-contact charging apparatus 1 according to the example of the rechargeable battery pack 200 for the above is also that the formation of the primary coil 70 to the top surface of the apparatus body (2) formed in a housing shape, and the spiral circle , in the form of a coil or a core with a rectangular or polygonal shape to configure the primary coil (70). 그리고 이와 같이 1차코일(70)이 구성된 무접점 충전장치(1)의 상부로 충전용 배터리팩(200) 또는 충전용 배터리팩(200)이 내재된 휴대용 단말기(300)를 올려 놓으면, 컴퓨터 또는 노트북과 연결된 상태에서 송수신용 데이터 및 전원용 전력을 공급되도록 구성한 것이다. And Placing the thus primary coil 70 is composed of non-contact charging apparatus 1, the portable terminal 300, rechargeable battery pack for the upper portion 200 or the charged battery pack 200 is embedded in, a computer, or from a connected state to a laptop configured to supply the data and power supply for electric power transmission and reception. 상술한 바와 같이, 본 발명의 바람직한 실시예를 참조하여 설명하였지만, 해당 기술 분야의 숙련된 당업자는 하기의 특허청구범위에 기재된 본 발명의 사상 및 영역으로부터 벗어나지 않는 범위 내에서 본 발명을 다양하게 수정 또는 변형하여 실시할 수 있다. Has been described with reference to a preferred embodiment of the invention, various modifications of the invention within the scope not departing from the spirit and scope of the invention defined in the claims of the skilled in the art is to in the art as described above, or it can be carried out by transformation. 상기와 같은 구성된 본 발명에 따른 무선 데이타 통신과 전력 전송이 가능한 무접점 충전기 및 이를 이용한 휴대용 단말기는 TC, TA, PC의 USB Port의 출력을 전원 입력으로 하는 유도기전력을 이용한 무접점 전력 전송에 의해 휴대용 단말기(휴대폰, PDA, MP3 player, DAB 또는 DMB 단말기, PMP(Portable Music Player), Handheld 단말기 등)와 컴퓨터(PC)간 무선 데이터 통신과 무선 충전을 동시에 가능하여 전송시 에러가 발생되지않고 안정적으로 데이터를 송수신하면서 전력을 함께 공급할 수 있는 효과가 있다. Wherein the wireless data communication and electric power transmission are non-contact charger and a portable terminal using the same possible in accordance with the present invention configured as is by a non-contact power transmission using an induced electromotive force to an output of the USB Port of TC, TA, PC to the power input is not a portable terminal (cellular phone, PDA, MP3 player, DAB or DMB terminal, PMP (portable Music Player), handheld terminals, etc.) to the computer (PC) an error during transmission to enable wireless data communication with the wireless charge at the same time between the occurrence stable as there is an effect that, while transmitting and receiving data can be supplied with electric power. 또한 본 발명에 따른 무접점 충전기는 충전하고자 하는 휴대용 단말기의 배터리 팩(2차측 무선충전 모듈이 내장된 팩) 이외의 다른 금속 이물질이 올려졌을 때, 이를 감지하여 차단시킬 수 있는 이물질 감지 기능과, 휴대용 단말기의 배터리 팩을 인식하여 충전상태를 인식할 수 있는 식별기능을 가지며, 과부하와 온도 프로텍션 기능을 제공하여, 기기의 손상을 방지하며 최적의 충전 효율 상태를 유지하도록 하는 효과가 있다. In addition, the non-contact charger when the other metal contaminants other than the battery pack of the mobile terminal to be charged (the secondary side of the wireless charging module is built pack) turned up, contaminants that can block detects the detection according to the invention, recognizing the battery pack for a portable terminal having an identification function that can recognize a state of charge, to provide overload and temperature protection features, prevent damage to the equipment and has the effect of maintaining the optimum charging efficiency state. 상기 전류센싱블록(60)은 상기 1차코일(70)과 대응되는 상기 휴대용 단말기측의 2차코일(80)에 의한 부하변조 신호를 감지하여 상기 MPU블록(30)으로 감지된 신호를 전송하도록 구성되어, 상기 MPU 블록(30)에서 1차코일(70) 및 상기 전류센싱블록(60)을 통하여 전송된 상기 2차코일(80)에 대한 감지된 신호를 분석하여 상기 휴대용 단말기를 인식하고 충전 전압을 안정전압으로 제어하도록 구성된 것을 특징으로 하는 무선 데이타 통신과 전력 전송이 가능한 무접점 충전장치. The current sensing block 60 is to transmit the signal detected by the MPU block 30 to detect the load modulation signal by the secondary coil 80 of the portable terminal side corresponding to the primary coil (70) is configured to analyze the sensed signal to the secondary coil 80 transmitted through the primary coil 70 and the current sensing block 60 in the MPU block 30 recognizes the portable terminal and charging wireless data communication and power transfer is contactless charging apparatus that can configured to control a voltage to a stable voltage which is characterized. 상기 직렬공진 컨버터(50)는 반파형 또는 전파형으로 직렬/병렬 공진형 컨버터인 LLC 풀브릿지 직렬 공진 컨버터인 것을 특징으로 하는 무선 데이타 통신과 전력 전송이 가능한 무접점 충전장치. The series resonant converter 50 is a non-contact charging device capable of wireless data communication and electric power transmission, it characterized in that the full bridge LLC series resonant converter in series / parallel resonant converter in a half wave or radio wave type. 상기 2차코일(80) 신호 중 배터리 충전상태 신호를 감지한 상기 1차코일(70)로부터 신호를 전송받아 상기 MPU 블록(30)의 제어에 의해 충전용 밧데리(230)의 충전상태를 표시하는 디스플레이부(3)를 더 포함하여 구성된 것을 특징으로 하는 무선 데이타 통신과 전력 전송이 가능한 무접점 충전장치. The secondary coil 80, the signal of the transmitting signals from the primary coil 70 detects the battery state of charge signal received indicating the charged state of the charging battery 230 for under the control of the MPU block 30 a display unit a wireless data communication and power transfer is contactless charging apparatus as possible, characterized in that configured by further comprising a (3). 음이온을 발생하고 세균 박멸용 항균 스프레이를 분사하는 이온 발생부(91)를 더 구비하는 것을 특징으로 하는 무선 데이타 통신과 전력 전송이 가능한 무접점 충전장치. Non-contact charging device generating an anion capable of wireless data communication and electric power transmission according to claim 1, further comprising an ion generating unit 91 for injecting the antimicrobial spray for bacterial eradication. 상기 휴대용 단말기의 고유ID를 감지하여 구별하는 휴대용단말기ID 감별부를 더 구성하는 것을 특징으로 하는 무선 데이타 통신과 전력 전송이 가능한 무접점 충전장치. Non-contact charging device capable of wireless data communication and electric power transmission according to claim 1, further constitutes a portable terminal ID for differentiating distinguished by detecting the unique ID of the portable terminal. 상기 충전회로(220)는 상기 충전용 밧데리(230)의 전원을 상기 휴대용 단말기로 공급되도록 구성된 것을 특징으로 하는 충전용 배터리팩. The charging circuit 220 charges the battery pack, characterized in that that are configured to supply the power to the battery 230 for the charging to the portable terminal. 상기 충전용 밧데리(230)의 충전정도를 감지하여 상기 무접점 충전장치(1)로 전송하는 충전감지부를 포함하는 것을 특징으로 하는 충전용 배터리팩. Charging battery packs, comprising: sensing the charge of the charging battery 230 for charging detection section for transmitting to the contactless charging apparatus (1). 상기 2차코일(80)은 분리형 변압기의 FPCB, PCB, 코일 및 페라이트 코어 중 어느 하나로 구성되고, 원형, 사각형 또는 다각형으로 형성되는 것을 특징으로 하는 충전용 배터리팩. The secondary coil 80 is configured by any of the FPCB, PCB, coil and ferrite core transformer of the removable circular charged battery pack, characterized in that is formed as a square or polygon. 상기 충전체제어부(210)의 제어에 의하여 상기 충전용 밧데리(230)의 전원을 상기 휴대용 단말기로 공급하는 터미널 블록(240)을 더 구성한 것을 특징으로 하는 충전용 배터리팩. Charging the battery pack to a terminal block 240 for supplying a power of the charging battery 230 for the by the mobile terminal by the control of the charging system fisherman 210 wherein further configured. 상기 무선 전력 수신 회로(513)를 감싸며 Al, Cu, 또는 Ni Alloy metal을 포함하여 구성되어 상기 무선 전력 수신 회로(513)에 자기장을 차폐하는 차폐부재(501)를 포함하여 구성된 것을 특징으로 하는 충전용 배터리팩. Charge, characterized in that is configured including the wireless power receiving circuit (513) surrounding Al, Cu, or Ni Alloy metal configured including a shielding member 501 for shielding the magnetic field to the wireless power receive circuit 513 battery pack. 제 7항의 무접점 충전장치(1)로부터 전원을 공급받고 데이터를 송수신하는 것을 특징으로 하는 무접점 충전장치를 이용한 휴대용 단말기. The portable terminal using a non-contact charging apparatus according to claim 7 characterized in that the receiving non-contact power from the charging equipment 1 for transmitting and receiving data. IrDA 컨트롤러(302) 및 무접점 충전장치(1)의 IrDA 포트(22)와 데이터 통신을 하는 IrDA 포트를 포함하여 구성된 것을 특징으로 하는 휴대용 단말기. IrDA controller 302 and the non-contact charging apparatus 1 of the IrDA port 22 and the mobile terminal, characterized in that configured including IrDA port for data communication. 상기 DC/DC 컨버터(320)에서 변환된 전력을 충전하는 충전블록(330)를 구성한 것을 특징으로 하는 무접점 충전장치를 이용한 휴대용 단말기. A portable terminal using a non-contact charging device, characterized in that configured the charging block 330 to charge the converted electric power from the DC / DC converter 320.